Lions International identified five focus areas of need around which Lions are uniting their global service. These Global Causes present significant challenges to humanity, and we believe it’s our turn to meet these challenges and actively support those affected by these challenges. The five focus areas include Vision, Childhood Cancer, Hunger, Environment and Diabetes. 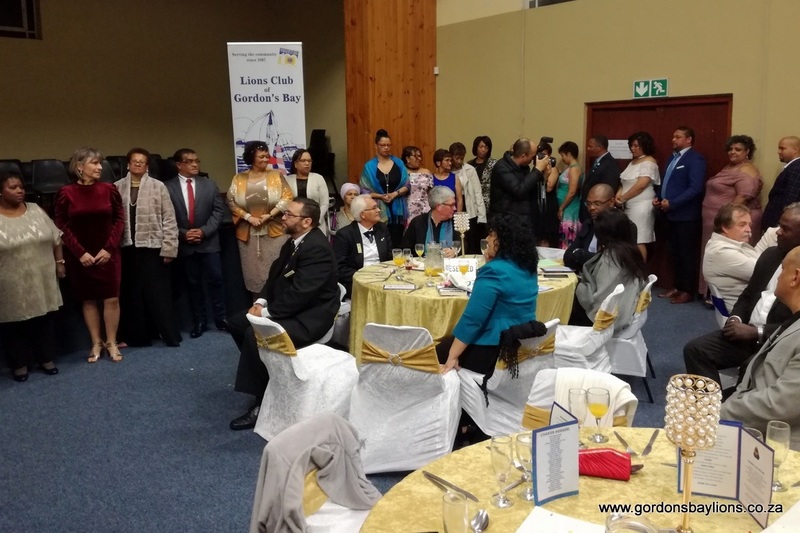 The Lions Club Gordon's Bay strives to actively support projects addressing the five focus areas within our community and district. We also believe that every journey begins with a single step. One act of service, one encouraging word, one gift of generosity is often all it takes to bring hope where it’s needed most. 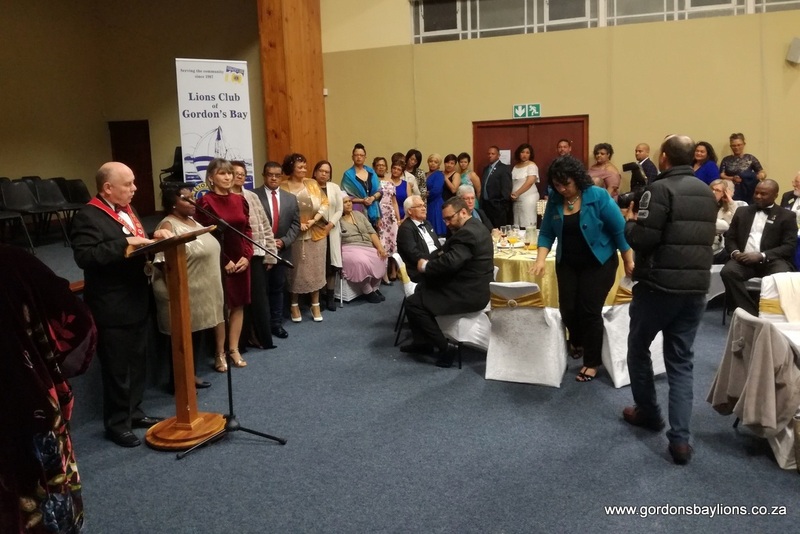 Herewith a reflection of our projects, initiatives and events in support of the focus areas; and areas of need as identified in the Gordon's Bay community and in our District. 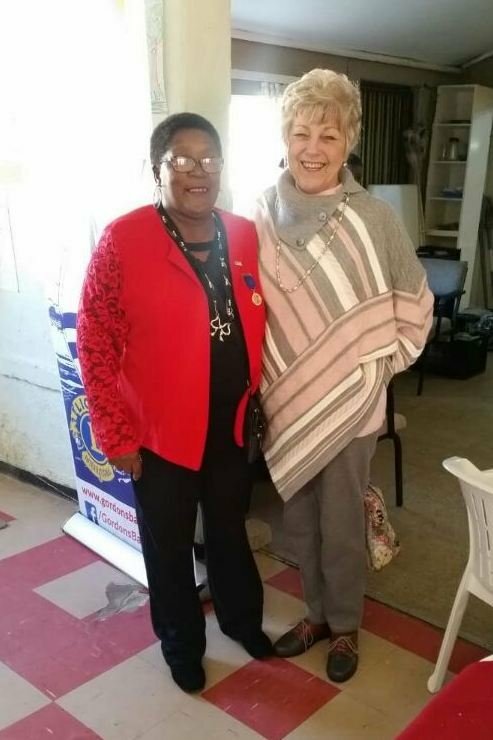 The Brackenfell Lions Club - South Africa & the Brackenfell Leos took and jailed the District 410A Governor and a mystery guest on the 8th of December at Pick n Pay Hyper Brackenfell at 11am. 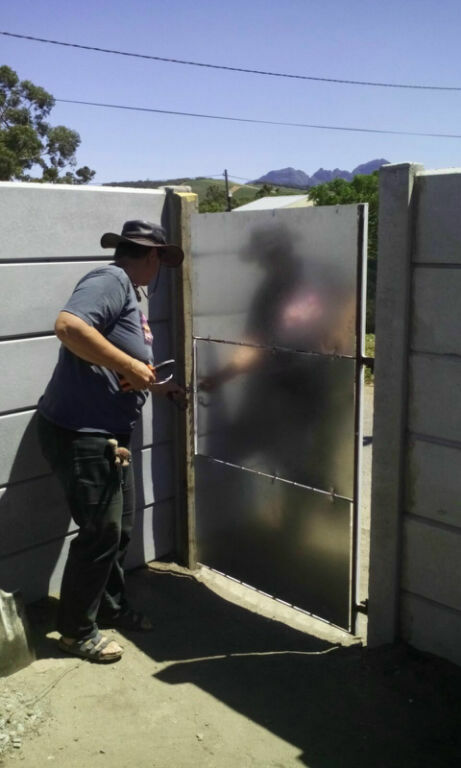 Lions District 410-A are looking to raise R1000 per Lion with this ongoing project, held captive within our borders of South Africa on behalf of the Project Lions4Lions. There are currently 10 000+ Lions being held captive in South Africa and as Lions, we have a responsibility of saving our Lions. Lions4Lions is very thankful that the district has started this long-term project. 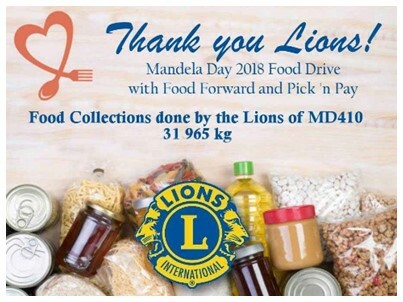 Thank you, Rocky Wright and all other helpers from Table View Lions Club, Merriman Lions Club, Athlone Lions Club and Malmesbury Lions Klub. 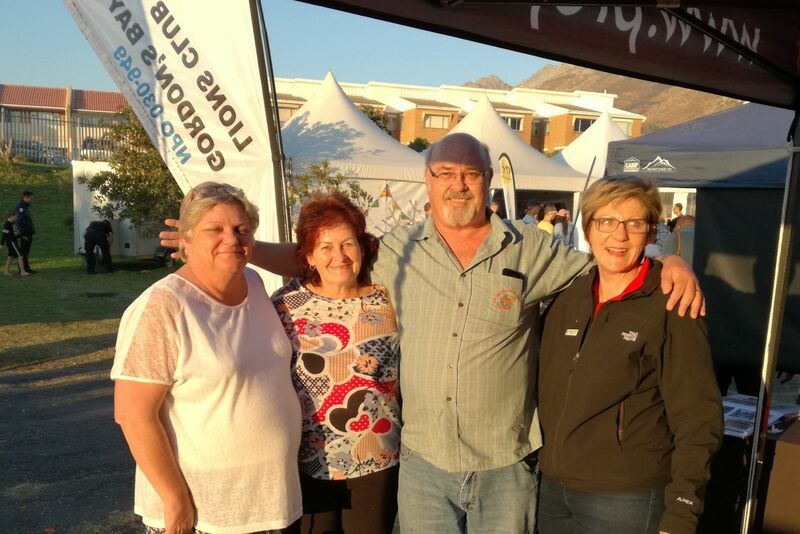 Also a big THANK YOU to our mystery guest Mandy, the Brackenfell PicknPay manager who really rocked the day. 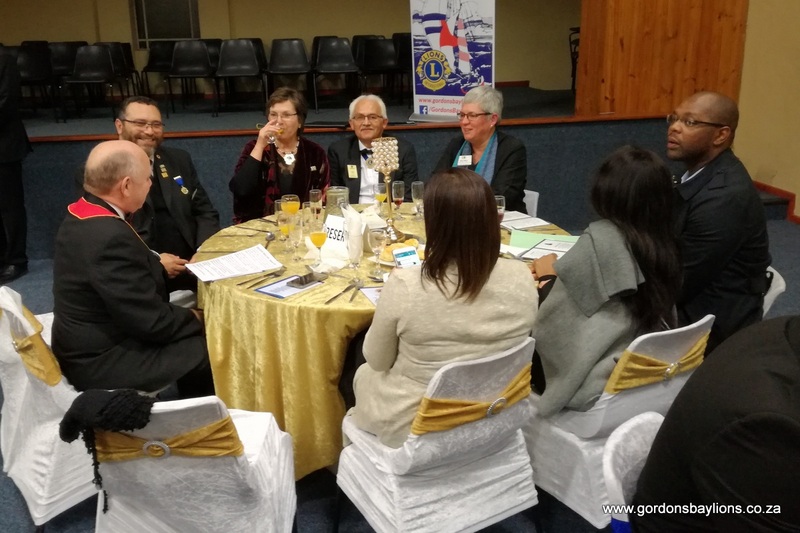 The District project will be going on until R 100 000 have been raised, with the purpose of raising the awareness of the plight of our Lions in Africa. 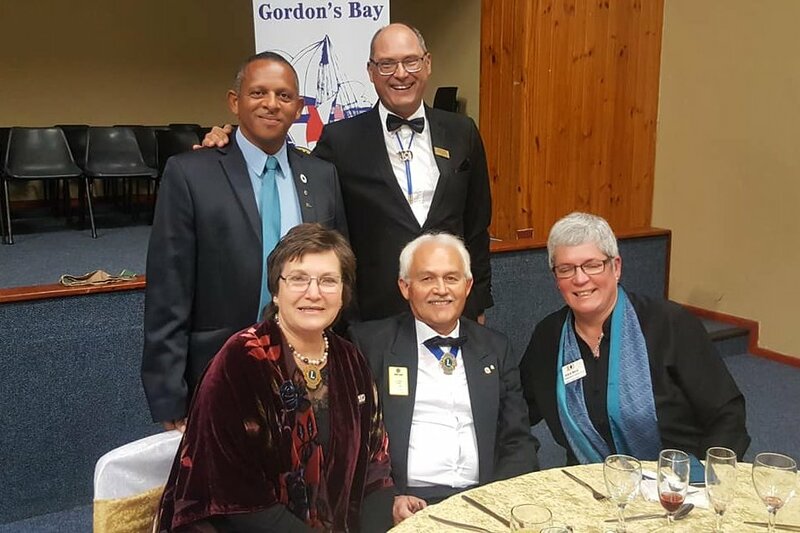 The Gordon's Bay Lions Club sponsored the new Kuils River Lions Club with the support of Guiding Lion Jimmy Lang who will assist the board and its members for two years to be successful in their functions; and Guiding Lion Jimmy Lang will orientate, motivate and train club officers and members in their club's growth and development. 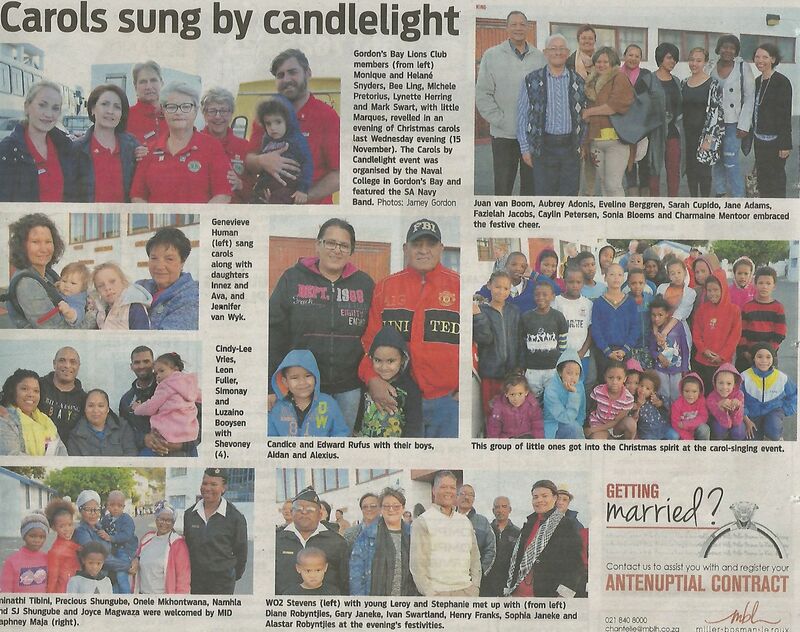 We invited 80 mothers, grandmothers and daughters to join us at the 9. 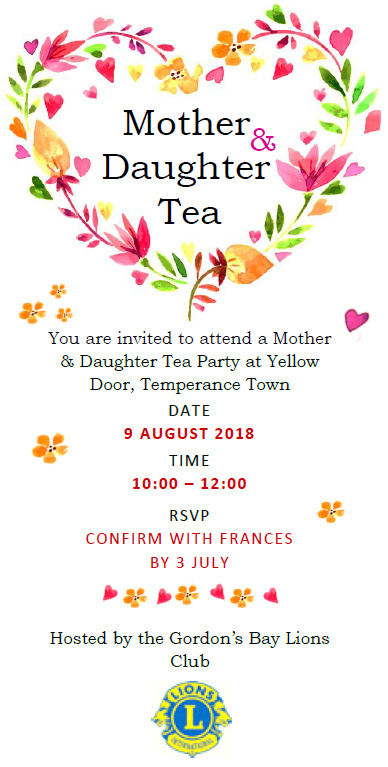 August 2018 at the Yellow Door Community Centre in Temperance Town and to celebrate Womans Day. The venue was beautifully decorated (Thank you Lynette and Suzanne) and delicious snacks prepared (Thank you Paula, Francis, Monique and Helanè). One of the highlights was motivational guest speaker Nicolette Smith whoshared the touching story of her life. We all enjoyed the event and had lots of laughter and fun. 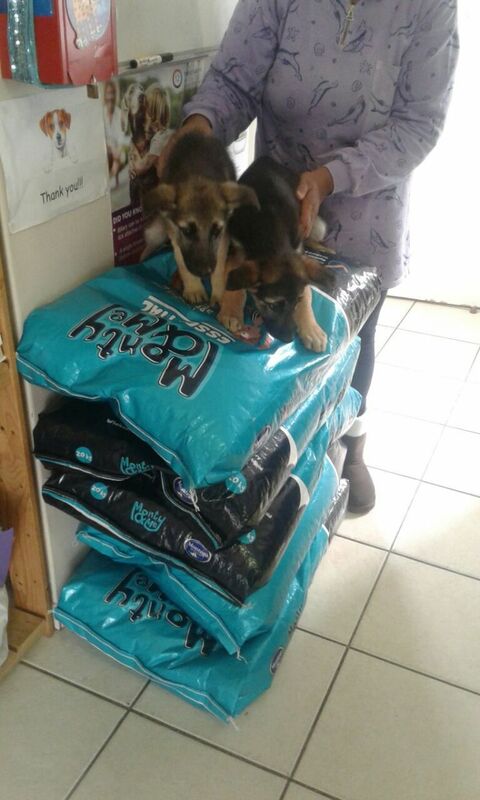 We would also like to say thank you to the Krystal Beach Hotel who supported us with beautiful gifts for our guests. Thank you all that helped to make the event unforgettable. We had a memorable day. 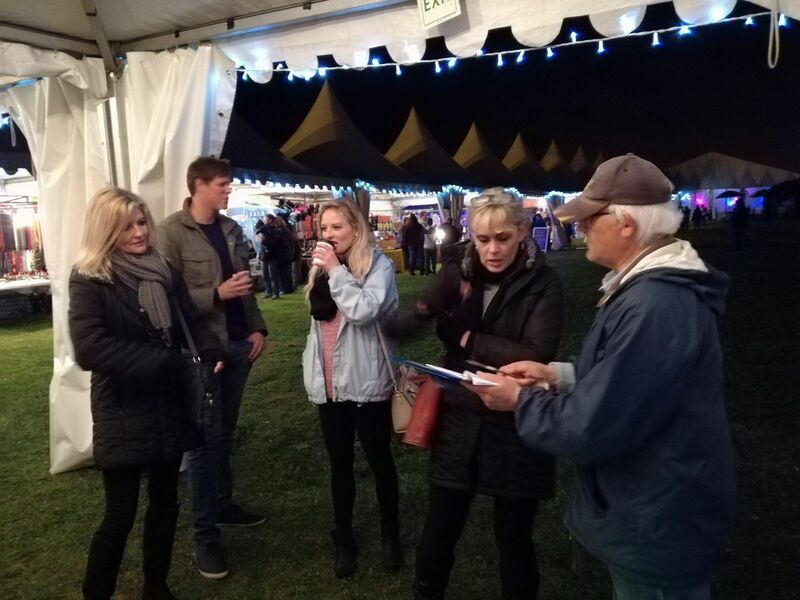 Every year, club members are dedicated to actively support the biggest event in our lovely hometown, the WINTER WONDERLAND FESTIVAL OF LIGHTS. 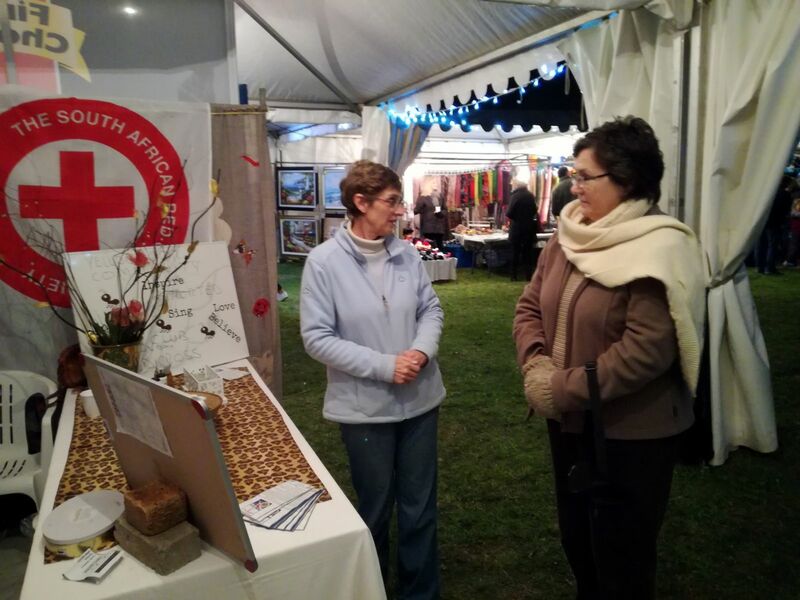 The famous festival draws up to 40 000 visitors to Gordon's Bay and we run our own stall to present our many projects to the visitors from near and far. 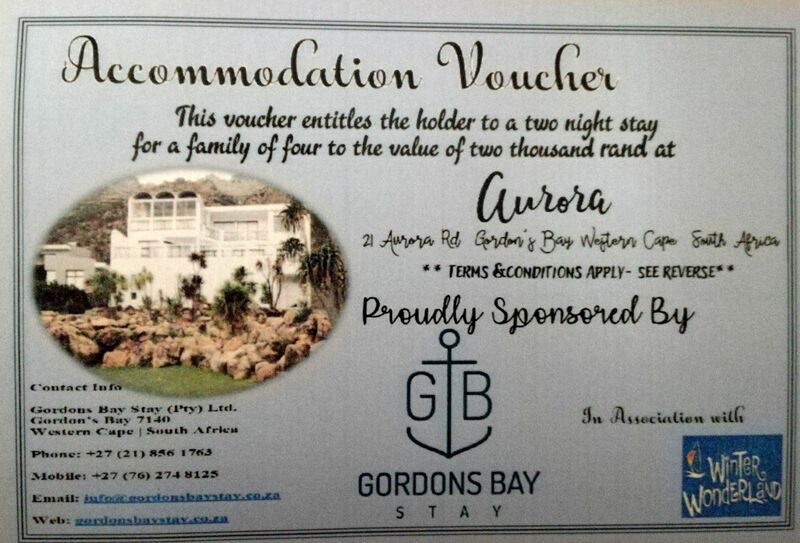 Lindy, a mom from Somerset West won our Facebook Competition, she received a voucher for a two night stay for four at the Aurora Penthouse at the value of R 2000 - sponsored by GORDON'S BAY STAY. 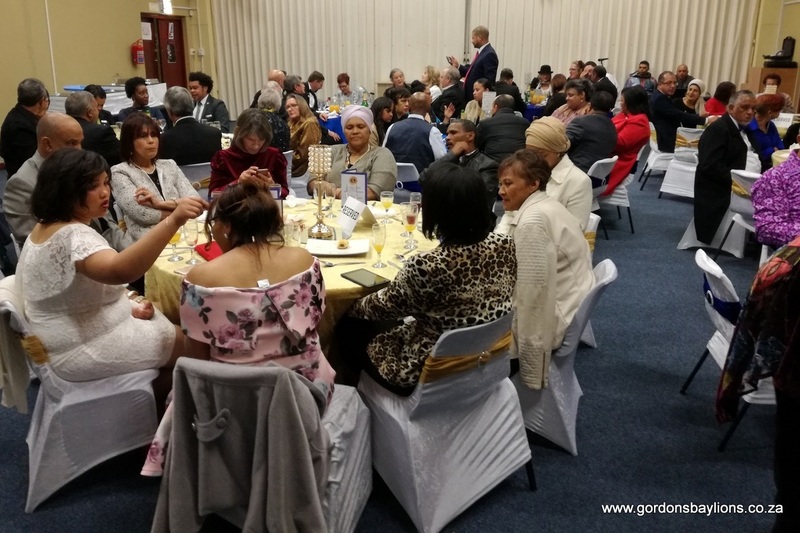 We enjoyed a wonderful evening of eating, drinking, laughing and sharing, during which time three compassionate members of our community were awarded with Louis Volks Humanitarian Awards. 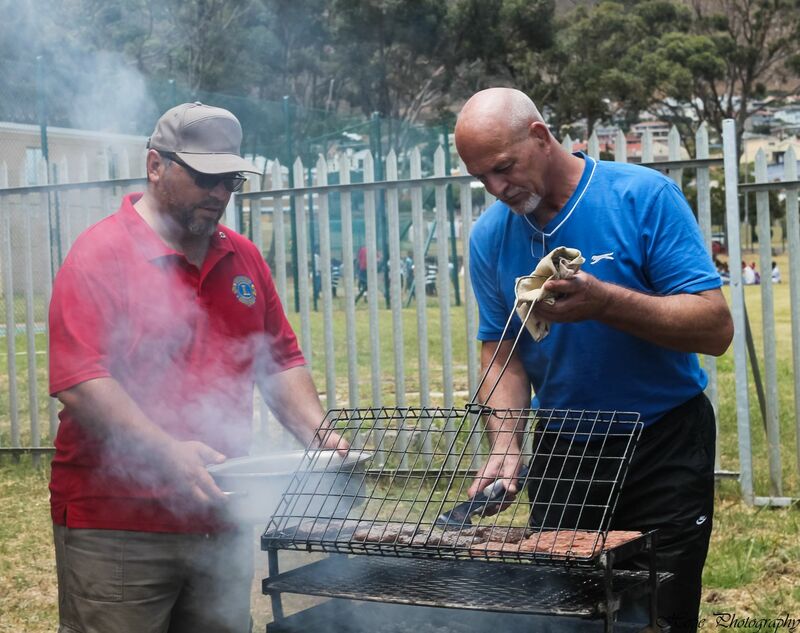 Gideon du Plessis, City of Cape Town's facility manager who always goes on the extra mile for the community and for our club, Francis and Yolande, the good souls of our Temperance Town Project at the Yellow Door Community Hall. Lion Paula Lang is now recognized as an esteemed member of the Foundation Honor Roll. 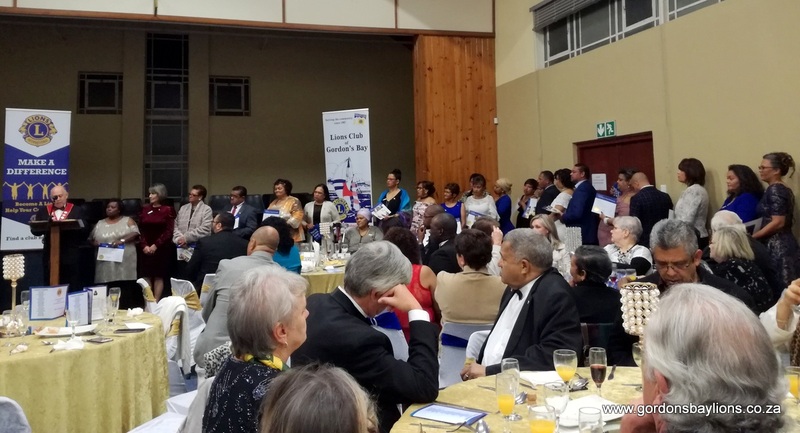 We held the induction of our incoming president Annette van Heerden, followed by a wine auction presented by MC Pieta Maré, where we raised R 7 500. 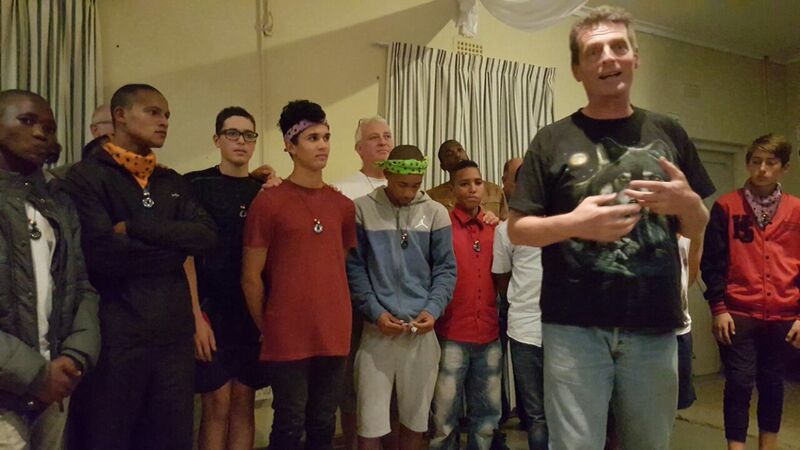 Our club matched this amount with R 7 500 and R 15 000 were donated towards the childhood cancer project Cure4Keanu. Lions Clubs International has adopted diabetes as a long-term commitment. Our work supports diabetes education, treatment, research and early detection. The World Health Organization estimates that over 422 million people worldwide have diabetes, a growing world epidemic that is expected to affect over 642 million by 2040. People with diabetes are at risk of losing sight due to diabetes eye disease. All people with diabetes – both Type 1 and Type 2 – are at risk. Diabetes can lead to other possible complications, including heart attack, stroke, kidney failure, leg amputation, and nerve damage. With these statistics and concerns in mind, Lions have taken action through the Diabetes program. Lions work with local community partners and national diabetes associations. 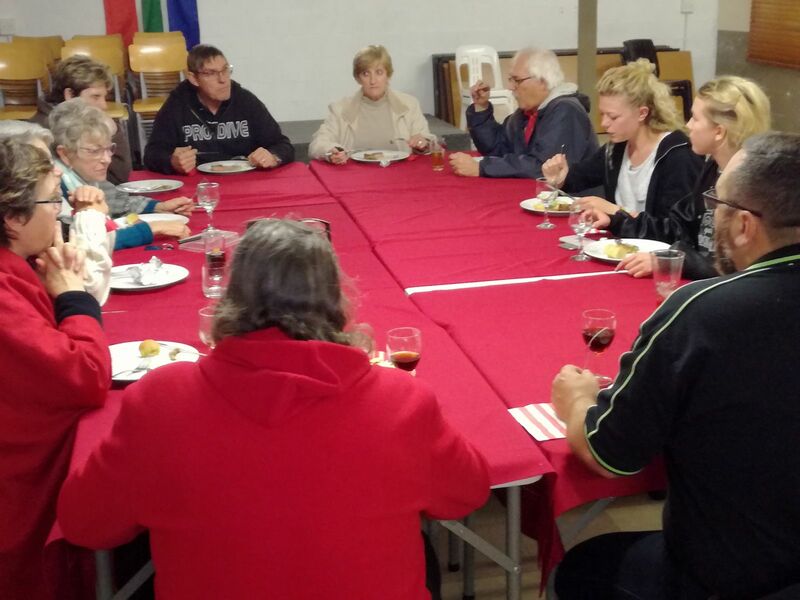 The group will meet once a month at the Temperance Town Yellow Door Community Centre. 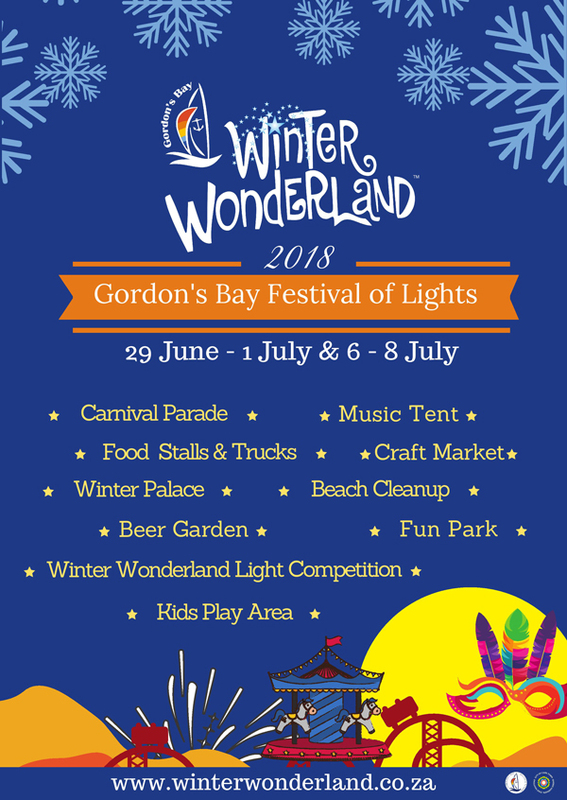 Please send us an email to info@gordonsbaylions.co.za if you would like to participate. Though the Lion as a symbol is a big part of the human consciousness across the planet, we are at risk of the Lion species entirely disappearing from the grasslands and mountains where they roam. In only a century their numbers came down from 350 000 to less than 20 000 today. There are fewer wild lions left than rhinos. 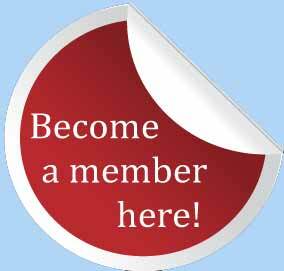 SAVE the LION - became now a roaring reality through LIONS Clubs members all over the world. 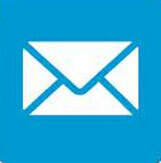 Lions4Lions is an ongoing project and a currently a database is been compiled. We collect and share informations about organisations that researches the lion species, that fights against lion exploitation and works on the reduction of Human-Lion conflicts. 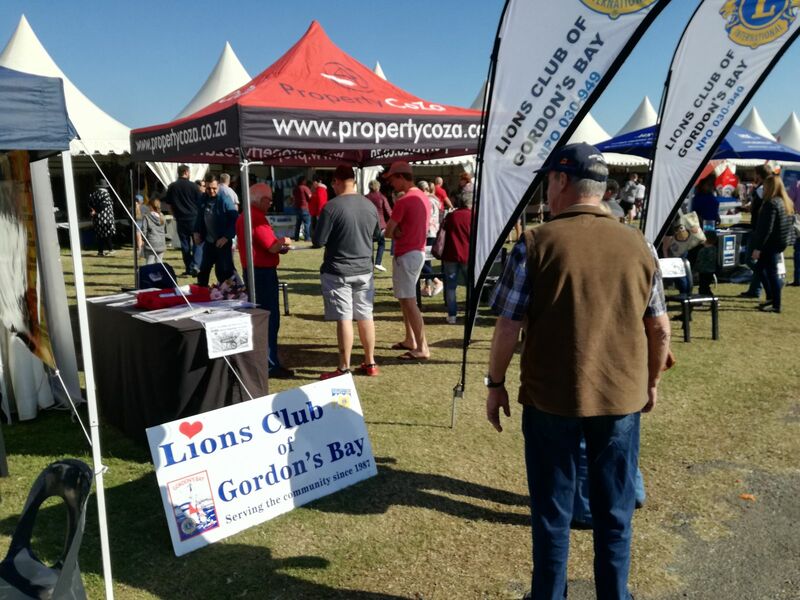 Contact Lion Bee via email to info@gordonsbaylions.co.za for more information about the project and join the Projects Facebook Group. 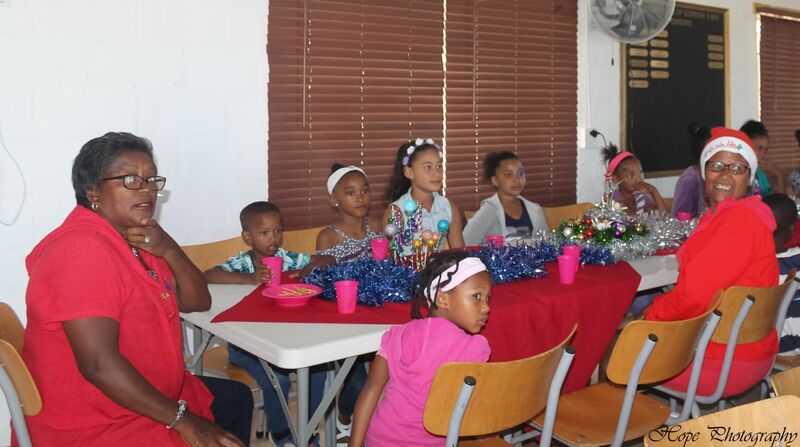 The children of our skills development class were invited to another fun-filled Christmas Party at our clubhouse. 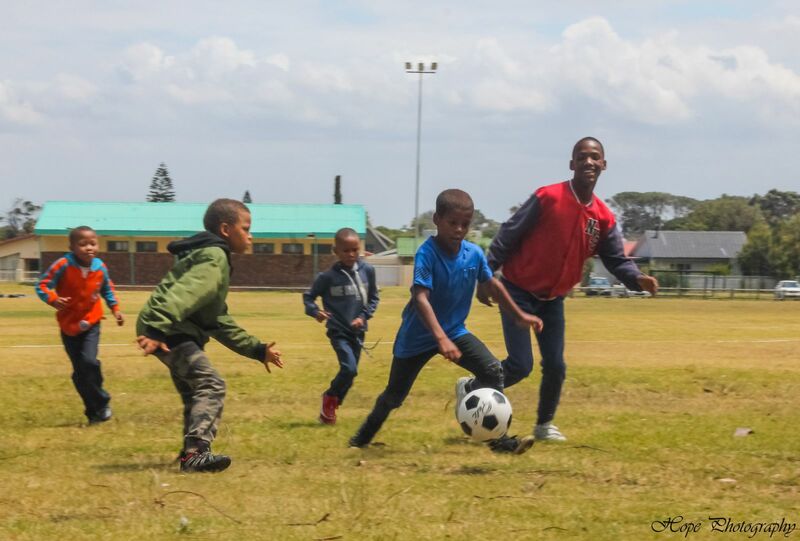 Everyone participated in lots of activities on the sports field opposite our clubhouse, with the assistance of the trainers of the local gym would had their energy matched by that of the children! 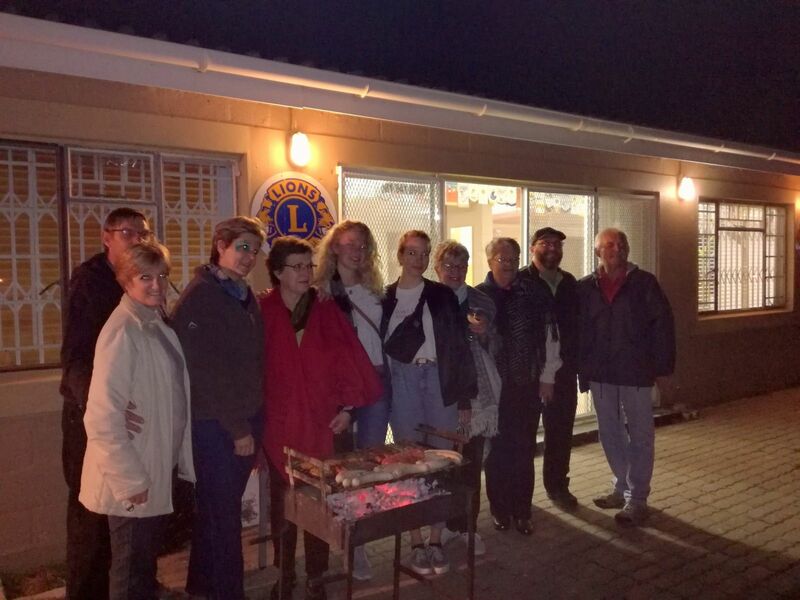 Each child received a gift from the Gordon's Bay Lions Club and everyone enjoyed the braaied burgers and chips, ice cream and juice. Thank you to Lion Lynette and Michele for the festive decorations; the braaiers and all the Lion members supporting this most enjoyable day! Once again the children that participate in our skills development class were invited to another fantastic Christmas Party at our clubhouse. Eagerly awaited by the kids Lion Michele opened the gate on a rainy Saturday afternoon for the more than 40 children from the Temperance Town community. The clubhouse had been affectionately decorated by the club members. The kids got treated with freshly braaied burgers and chips, fruit skewers and juice. Each child received a big present from the Lions team. For sure the traditional cup cakes were not to be missed. Games and videos kept the children busy throught the afternoon. A big THANK YOU to all the LIONS that helped to make this Christmas Party unforgettable. 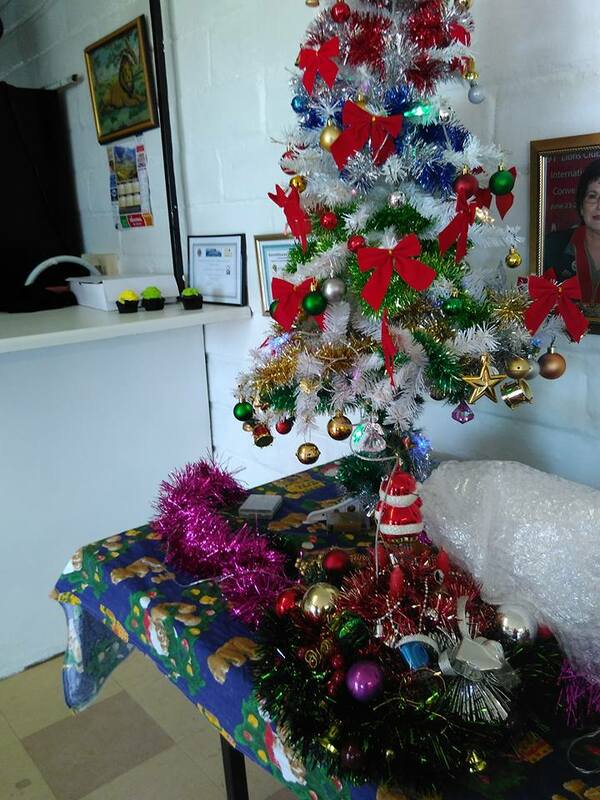 25.11.2017: We held our yearly SENIORS CHRISTMAS DINNER, almost 60 seniors from Temperance Town and from Sencit Old Age Home had a very very special treat at our clubhouse, while almost all Lion members were on board to help decorating, preparing food, braaing, serving and having fun with the seniors. Lion Michele was the hero of the day, she had not only organized the decoration of our clubhouse, but also made all the salads, marinated the meat and so on. But, there's more. 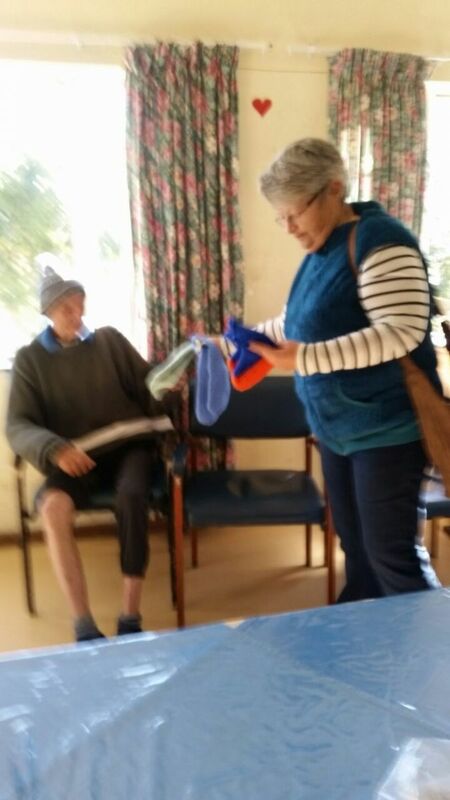 Our Temperance Town Skills Development Group had knitted squares for blankets, Lion Michele was the one sewing all of them together in myriads of hours. 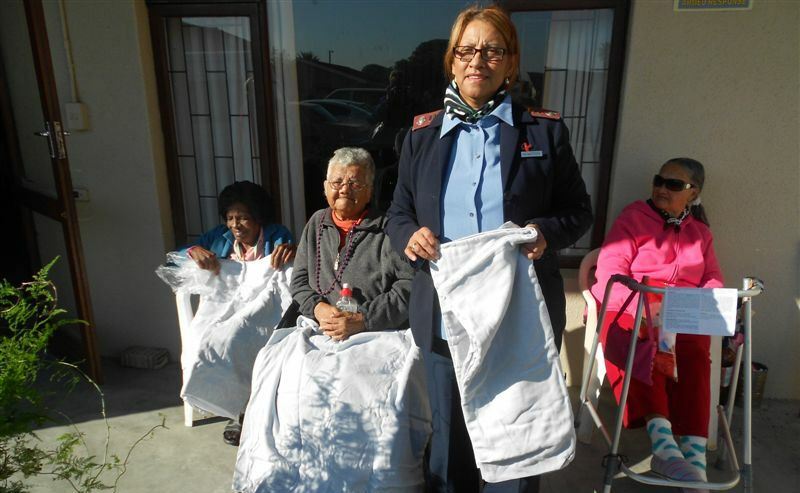 Two lucky ladies were the winner of the two beautiful blankets made by the Gordon's Bay community. Each Senior also received a special gift. 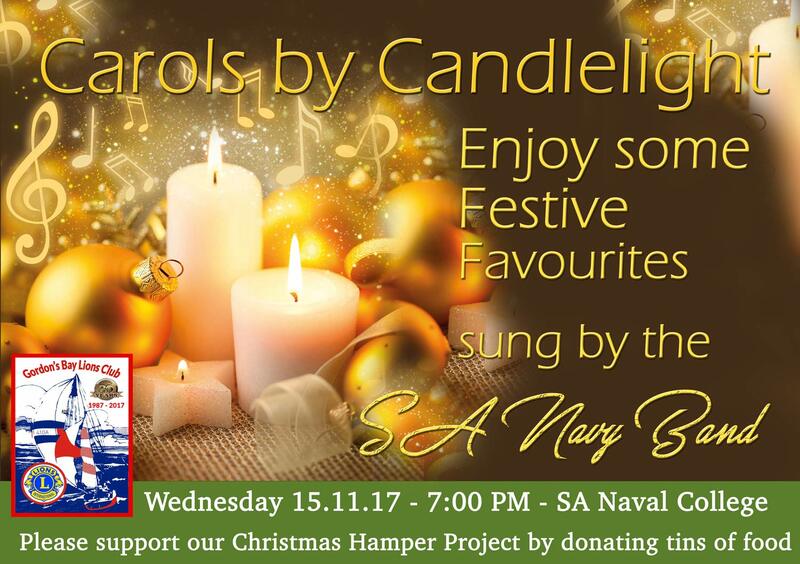 Every year just before Christmas, the SA Navy organises a Carols by Candlelight function at the Naval Training College in Gordon's Bay with the proceeds going to charities in the Gordon's Bay area. 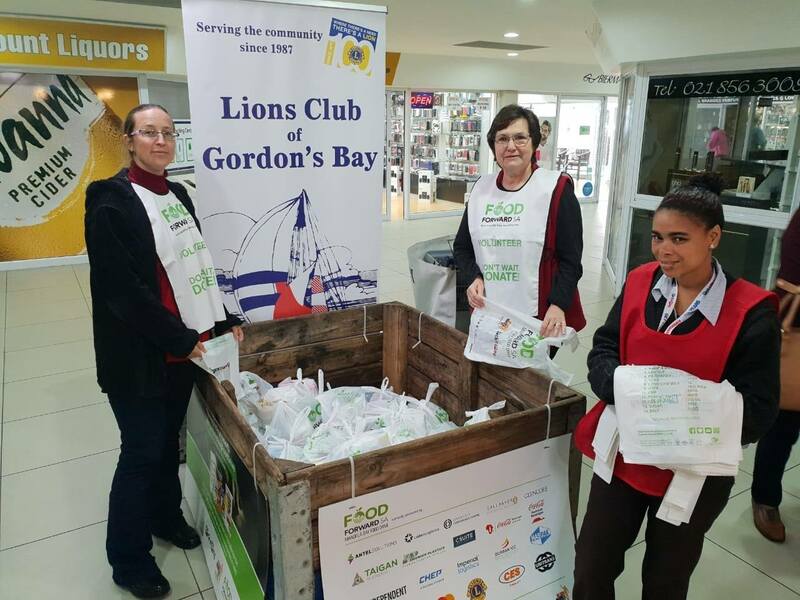 Our club has been supporting them for many years by promoting this event and encouraging members of the public who attend to donate non-perishable food to be distributed to families in need over the festive season. A beautiful sunset ceremony was conducted, followed by the Christmas Carols performed by the SA Navy Band and their choir. The little ones were thrilled by Santa Claus and his elves. Our club received generous donations of tins and dry food for our Christmas Hamper project. Fifty years ago, UNESCO officially proclaimed 8th September International Literacy Day, to actively mobilise the international community and to promote literacy as an instrument to empower individuals, communities and societies. 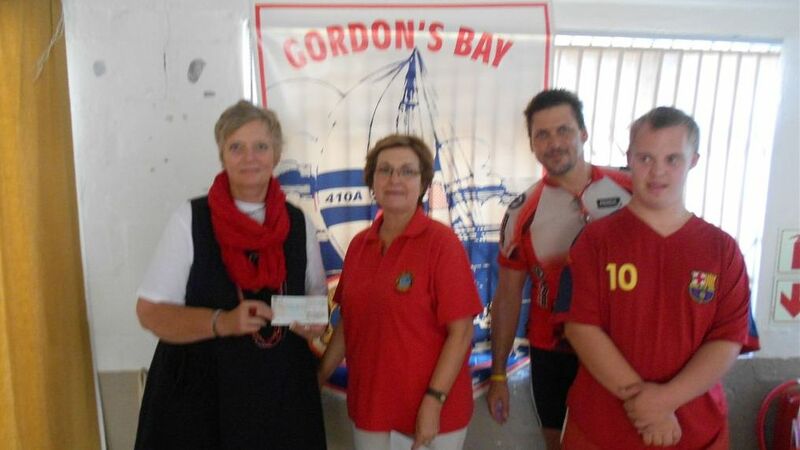 The Gordon's Bay Lions Club supports the library at the Temperance Town Primary School from its humble beginnings in 2008, just recently R 5000 for books were donated by the club to keep up with the ever-growing numbers of pupils. To celebrate International Literacy Day, club members organised a reading marathon at the library at the 8th September 17. Over 30 highly motivated pupils did read from their favourite books, 3 hours without any break and each of them received a certificate. 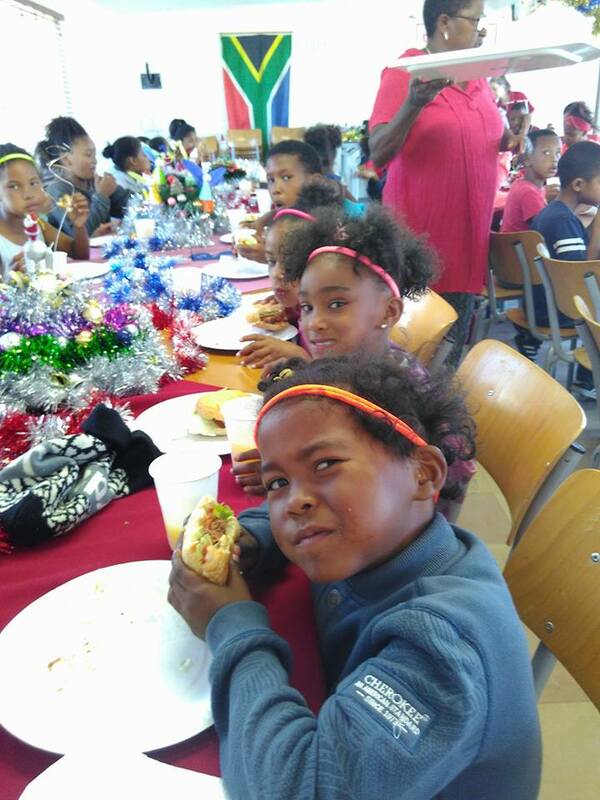 5.12.2016 - The skills class children wre treated with burgers and chips, cupcakes and ice cream. Each child receieved a little present and everybody, kids, team members and club members had lots of fun. Lion Monique and Helane initiated some outdoor games on the sportsfield. Our club is blessed with our own clubhouse where we can easily accommodate such beautiful events, where club members meet and enjoy the time with our children or with the seniors from the surrounding areas. 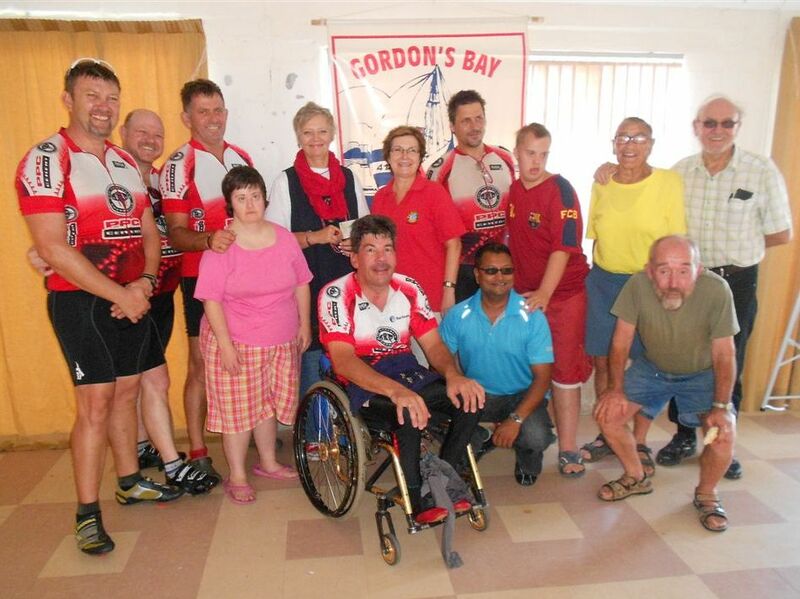 In the beginning of 2017, the Gordon's Bays Lions Club celebrated one year of its Skills Development Project in Temperance Town. The Temperance Town children participating at the skills development project enjoy many happy hours playing and creating individual projects such as birthday cards, painting, drawing paper mache and knitting. 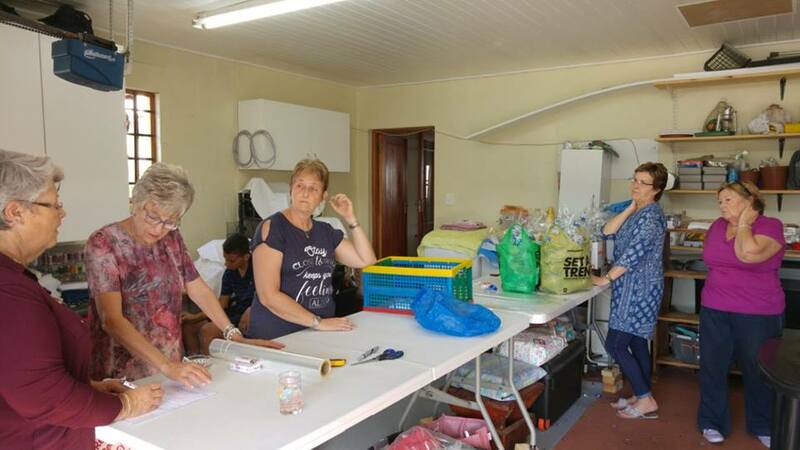 For many years it was the dream of Lion Paula Lang to start a skills development project and when Lion Michele Pretorius joined the Lions Club, the foundation of this project was laid. The project started in 2016 with a few children to learn the basics of knitting and soon the group had grown to more than 20 Temperance Town girls and boys. Every week another project and technique is planned to allow them to use their own imagination, and learn skills such as cutting, drawing and painting which imporves their hand and eye co-ordination. The lessons also include life skills such as compassion for others and respect for the environment. 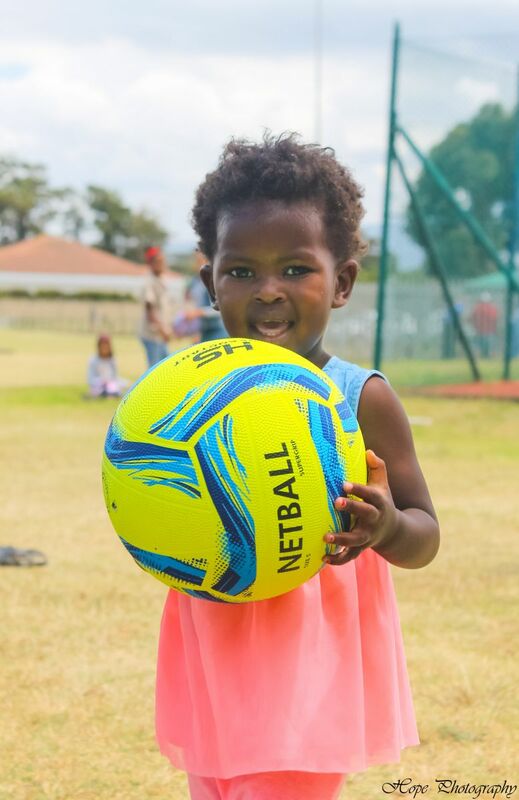 If you would like to get involved in our skills development project please contact us at 0813410980 or send an email to info@gordonsbaylions.co.za. 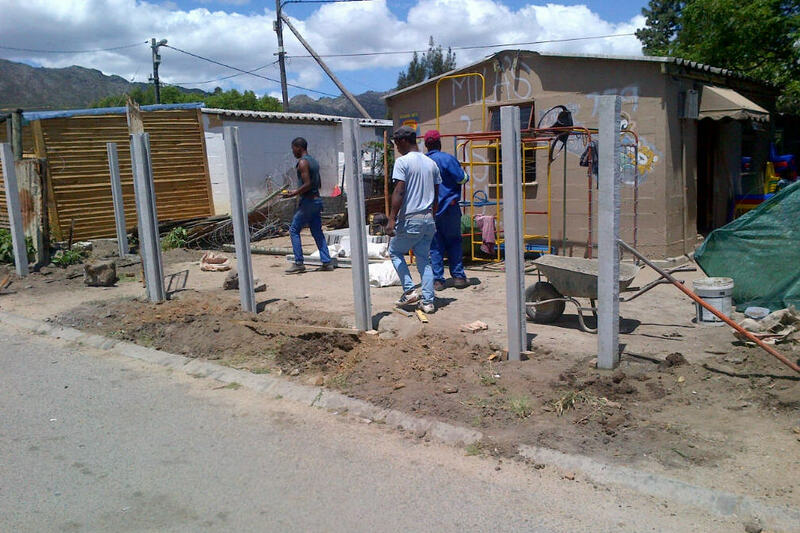 In March 2016 we organsied a Street Clean Up around the local community centre "Yellow Door". The children received a hot dog and a juice in exchange for a bag of rubbish. 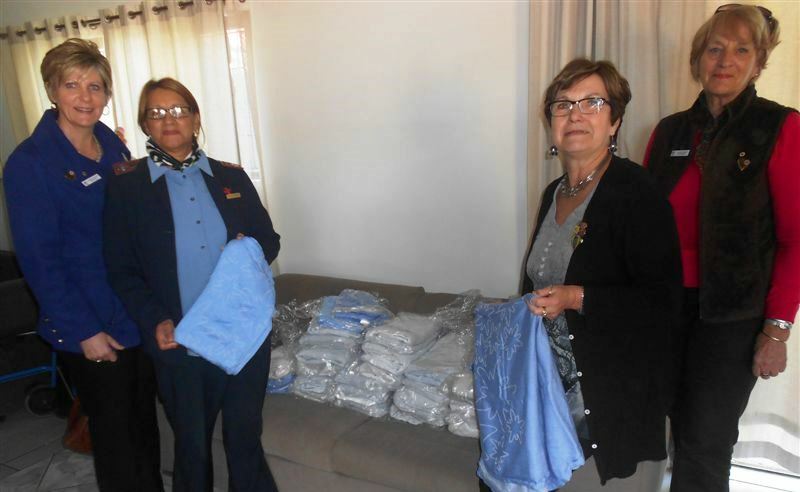 Huis Silverjare is home for elderly people in Grabouw and the Gordon's Bay Lions Club has been assisting them for many years with the provision of needed supplies such as linen, cutlery and crockery and other items and equipment that help to make the lives of the residents more pleasant. For our 2017 Mandela Day Project lots of socks were collected by learners from the local Gordon's Bay Primay School. 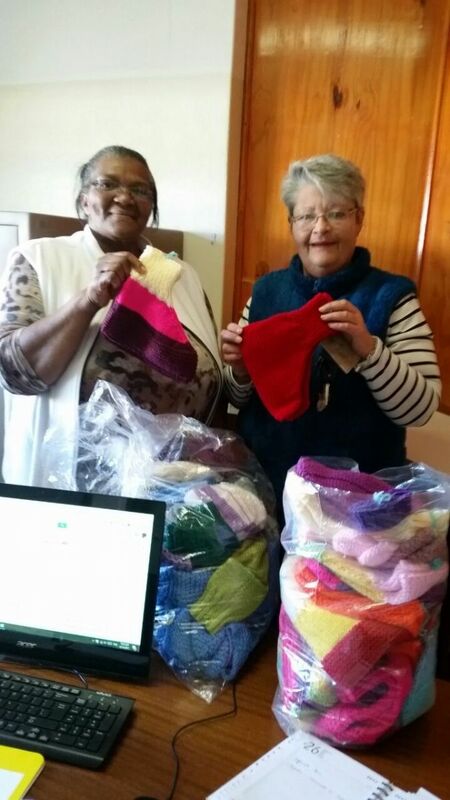 The residents of Huis Silverjare each received a pair of socks. 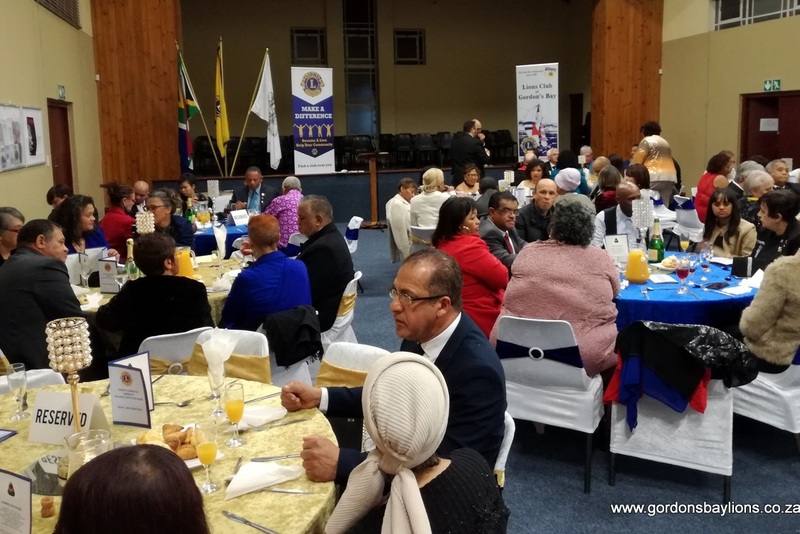 In Celebration of the Lions Club International 100th Birthday, the Lions Club of Gordon’s Bay celebrated the milestone with a high tea at the Grabouw old age home Huis Silverjare. 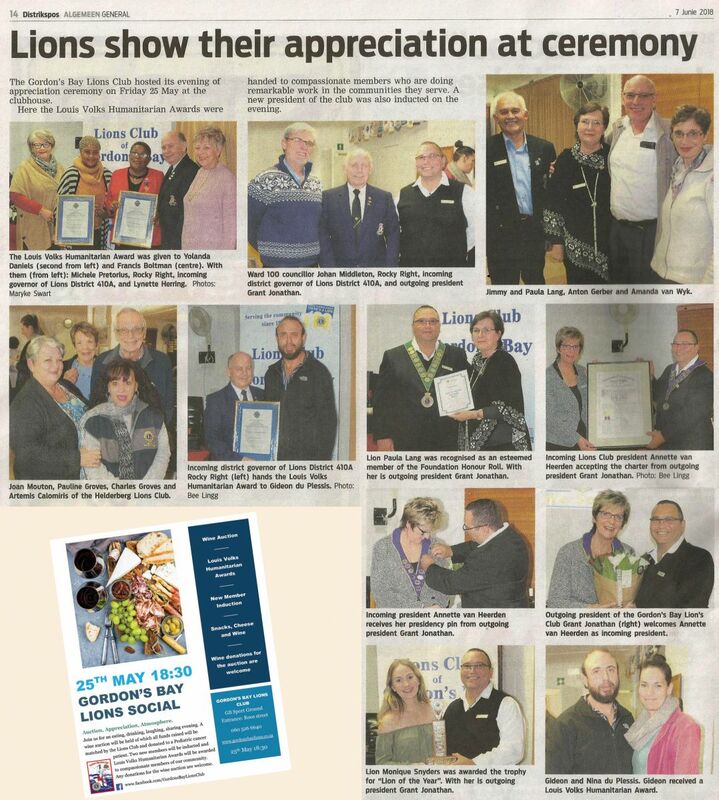 Almost all Gordon’s Bay Lions swarmed out to deliver 100 beautifully decorated Lions 100 years cupcakes. 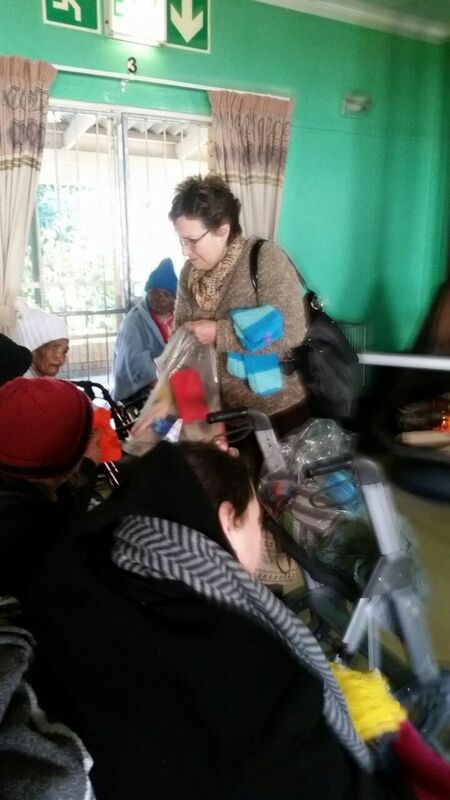 The old age home residents and staff were treated with cupcakes, tea, some baked goodies and a bit of sweets. The clubs DJ, Lion Pieta Maré, made the impossible possible, with his music (he had brought his sound equipment with) the seniors and staff did not only sing with us, but some really became amazed and started dancing. In August 2016 our club refurbished and upgraded a frail care men's unit. We delivered bed linen, curtains, rods and other bedroom essentials. 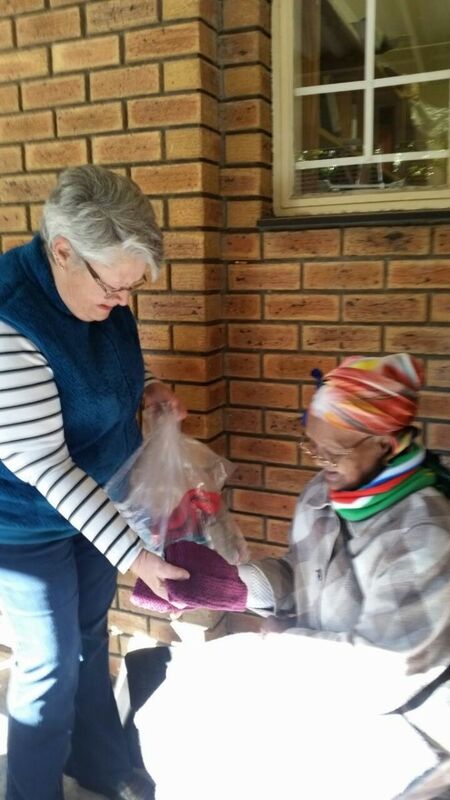 We also deleivered 80 beanies which were distributed immediately to the happy residents. A big thank you to our members and relatives who knitted them in their free time. At a later visit we could happily watch the residents using the beanies. 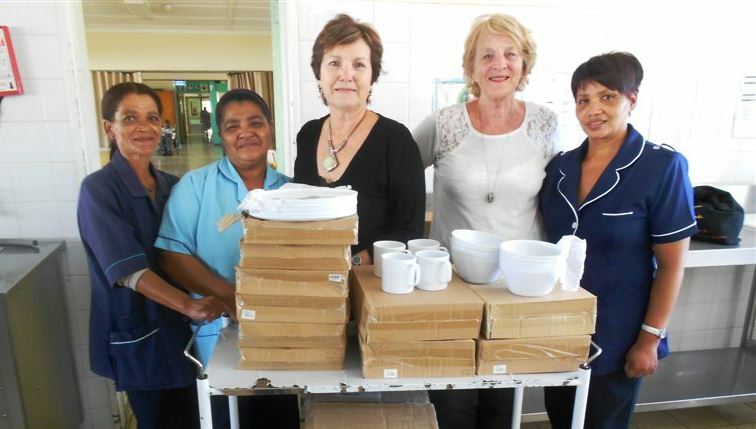 Lion President Paula Lang (centre) with staff members and Lion Iris Basson with 84 melamine bowls,plates and mugs that were donated by our club in February 2015. In May 2015 we refurbished two frail care rooms in the home and provided new curtains, curtain rods and bedding. 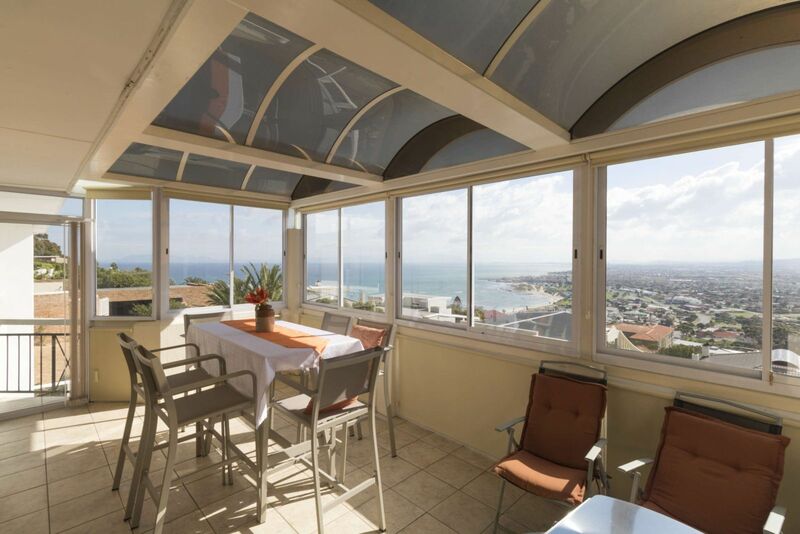 We also have regularly organised food and entertainment on special days for the benefit of the residents. 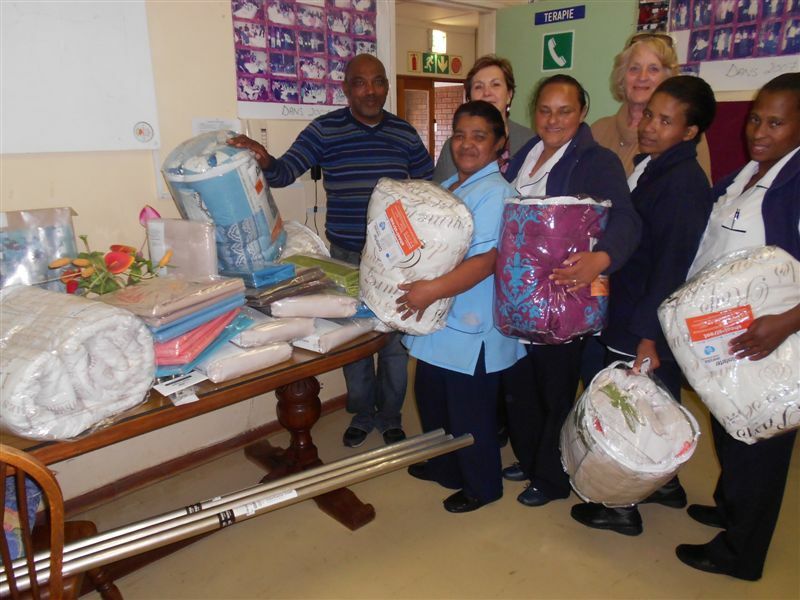 Again in July 2015 we refurbished a further two frail care rooms in the home and provided new curtains, curtain rods and bedding bringing the total value donated to more than R10 000.00. 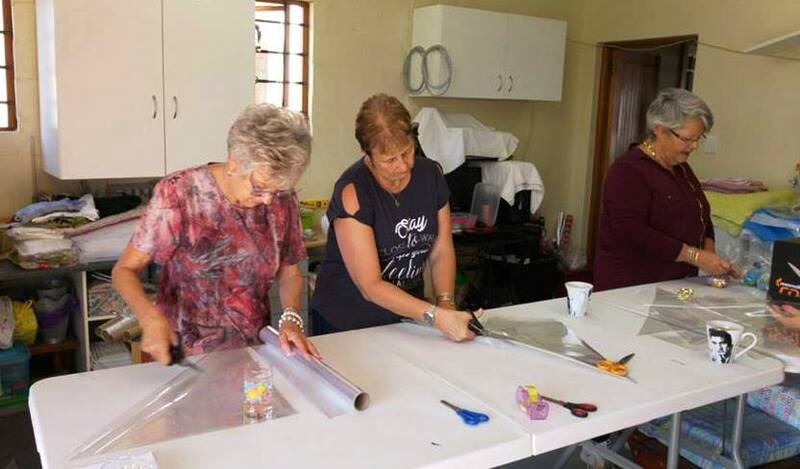 Aanhouwen Home is a work and care centre for mentally and physically handicapped adults in Somerset West and every year our club organises a special event for the residents. In March 2016 we organised a visit for 70 residents to the local Monkey Town Primate Centre, a wildlife Centre for monkeys and apes with more than 230 animals and 28 different exotic species. Everybody had a enjoyable day and after a guided tour lunch was served by our club members which included sandwiches, egg, fruits, a juice and yoghurt. 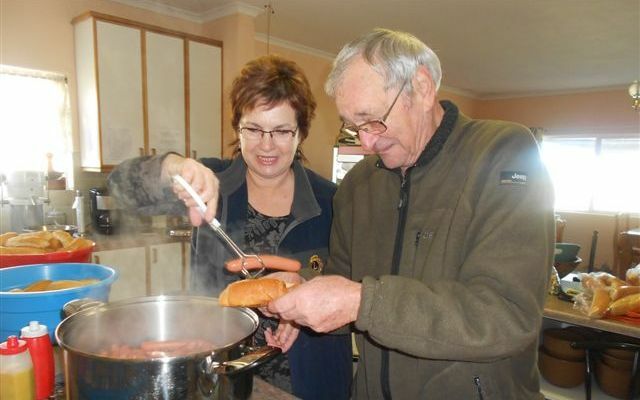 April 2014: Lion President Paula serving up lunch to the guests at our clubhouse. 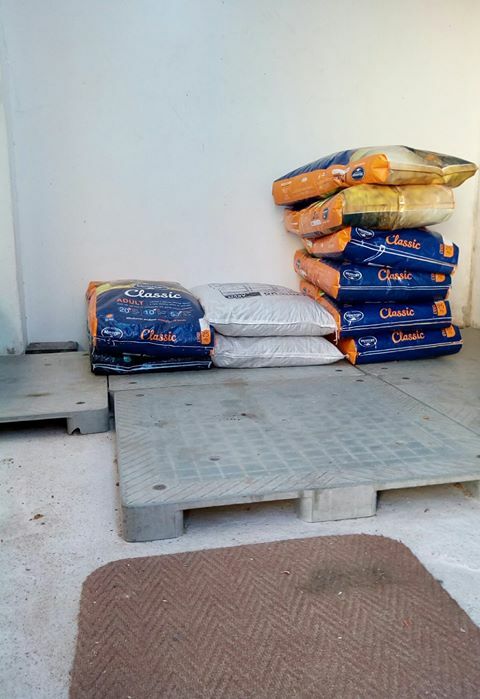 Our club has been supporting Gordon's Bay Animal Welfare for many years with a monthly donation of R500.00 worth of pet food, which was increased to R600.00 per month in 2016 and to R1000.00 in 2017. 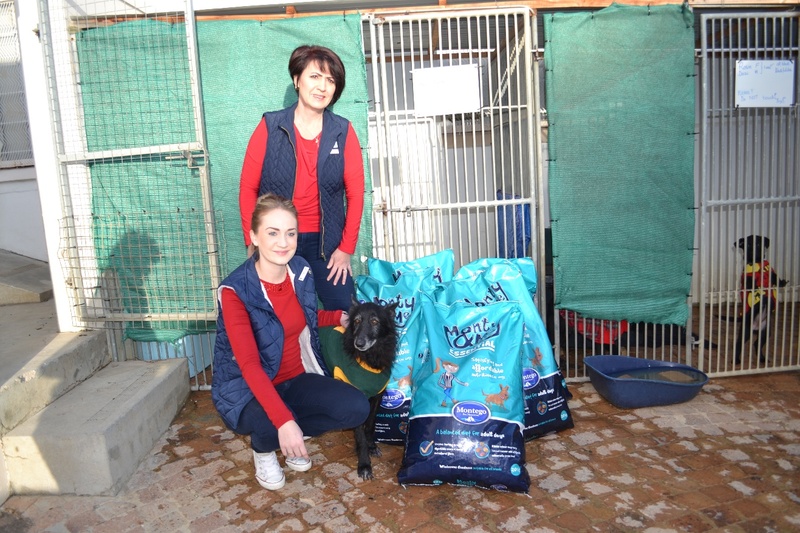 In June 2017 as part of Lions International 100th Centenial Project to mark the day in 1917 when Lions International was founded our members Annette van Heerden, Helene Snyders and Monique Snyders delivered an additional donation of 100 kg of pet food. 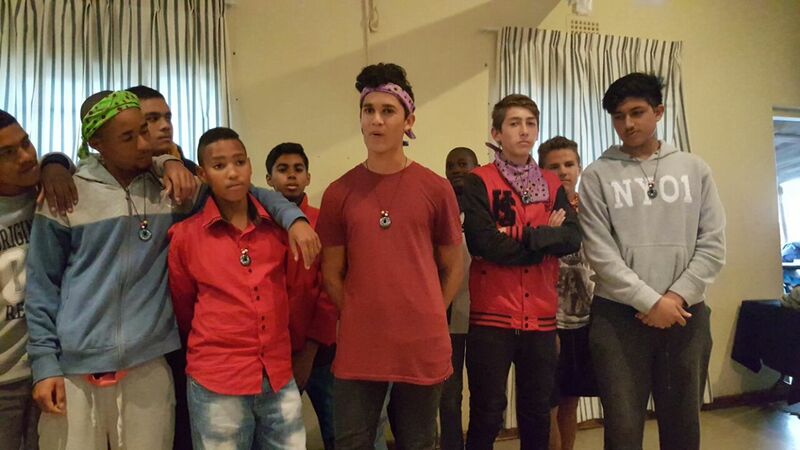 Boys to Men is the South African branch of a US based organisation, which is sponsored by Lions Clubs International, http://www.boystomen.org.za. 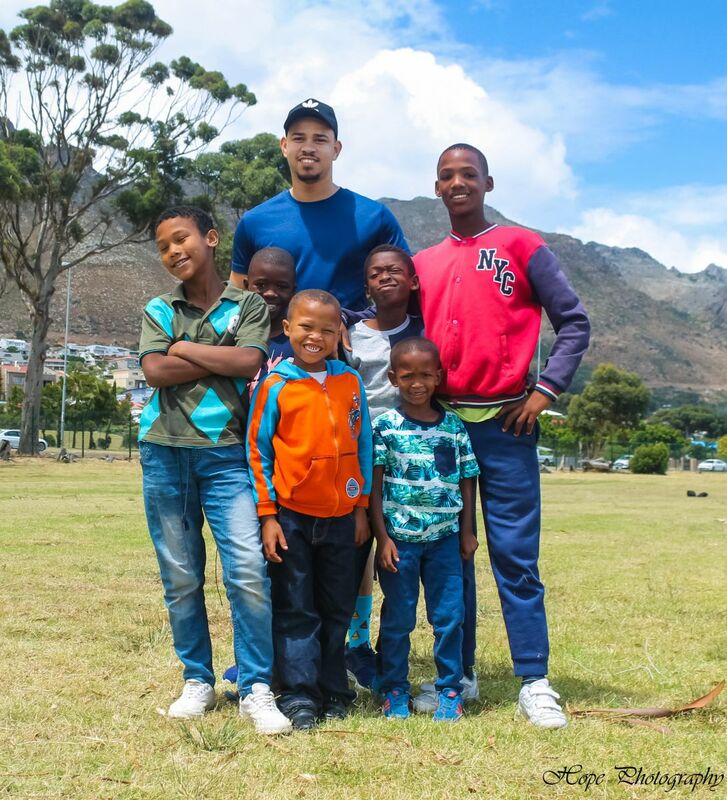 Boys to Men is a community of dedicated men whose aim is to guide and support young, often fatherless or underprivileged boys, on their journey to manhood. 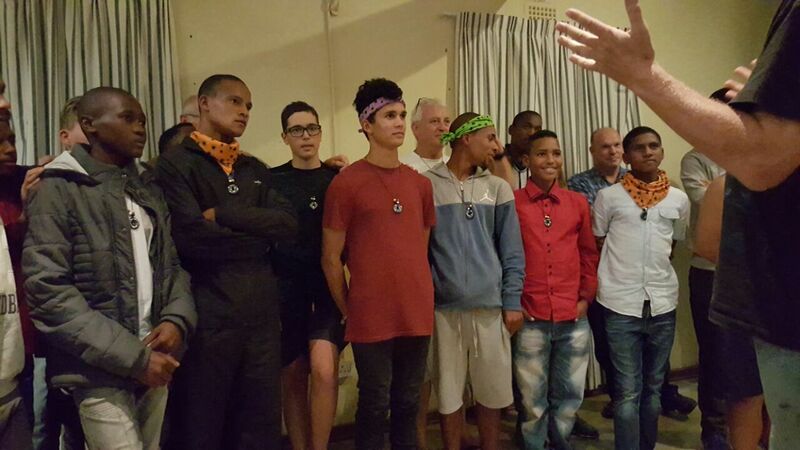 Our club sponsored two young men, Kynne Theodorou and Jordan Jonathan, at a cost of R1000.00 each, to enable them to attend a Boys to Men Youth Camp from 5th to 7th May 2017 at Bloublommetjies Farm in Wellington. Both Knynne and Jordan have shown signs of leadership, but were lacking life skills and experience. 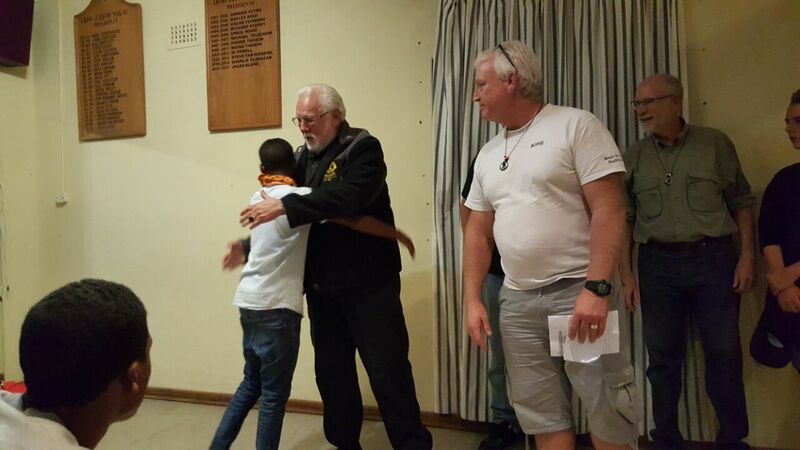 They successfully completed the Camp, and were welcomed back at a homecoming ceremony held in the Tokai Lions clubhouse. 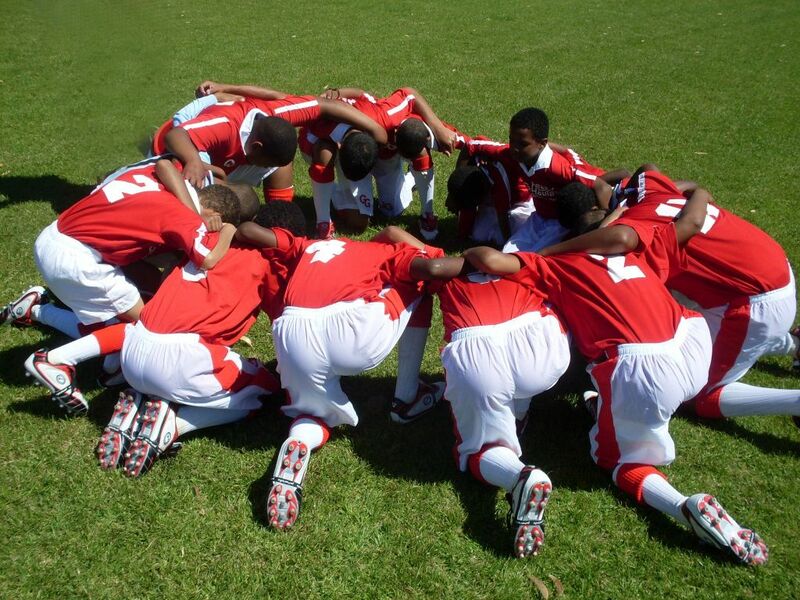 The camp was a resounding success and the boys shared their personal experiences with us during the “Honoring Ceremony”. 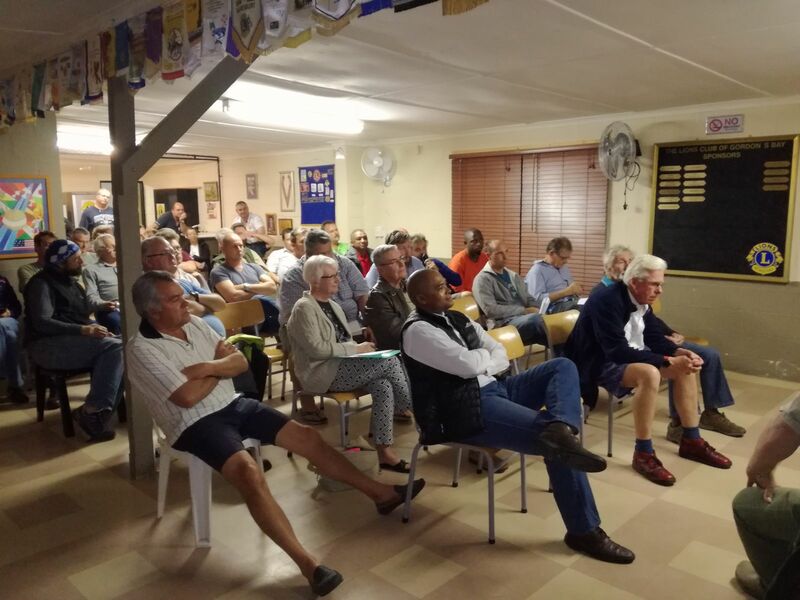 The Mountain View Cycle Club have been running a cycle tour from Bellville to Oudtshoorn for many years and held their 18th tour in February 2016. 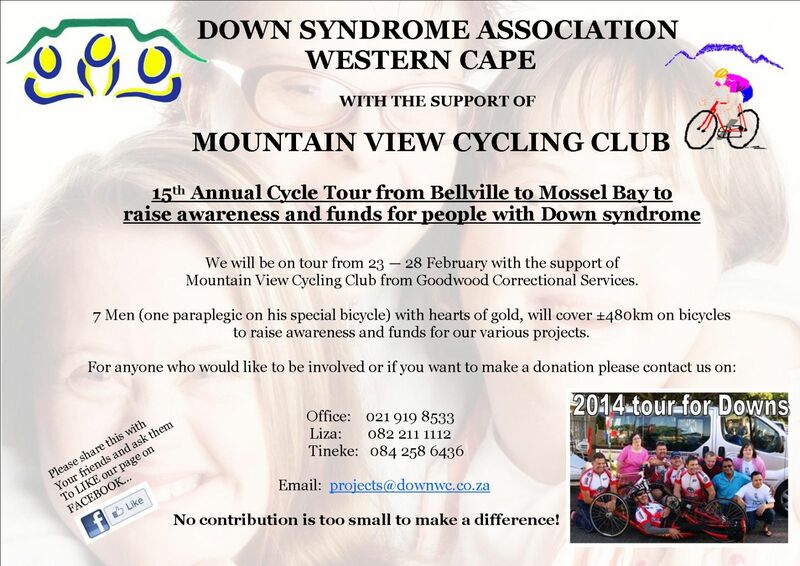 The tours aim to raise funds and create awareness about Down Syndrome. 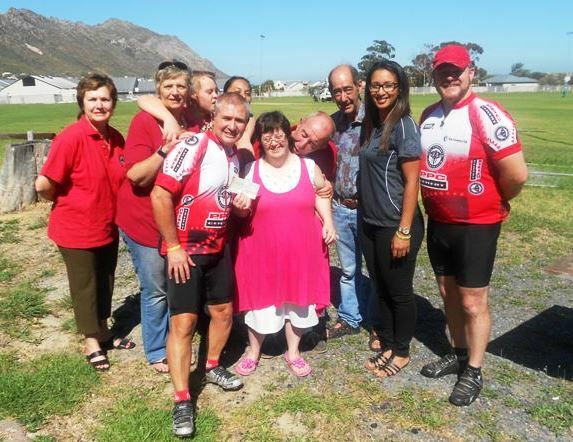 Our club has been hosting them for their first stop at our clubhouse for a number of years and this year as usual, we provided mid-morning refreshments and presented them with a cheque made out to the Down Syndrome Association for the amount of R2 000,00. Find a newspaper article about the 2016 cycling tour. In 2017 our club donated R 2500. The 2017 tour was the most successfull fundrasing tour ever. 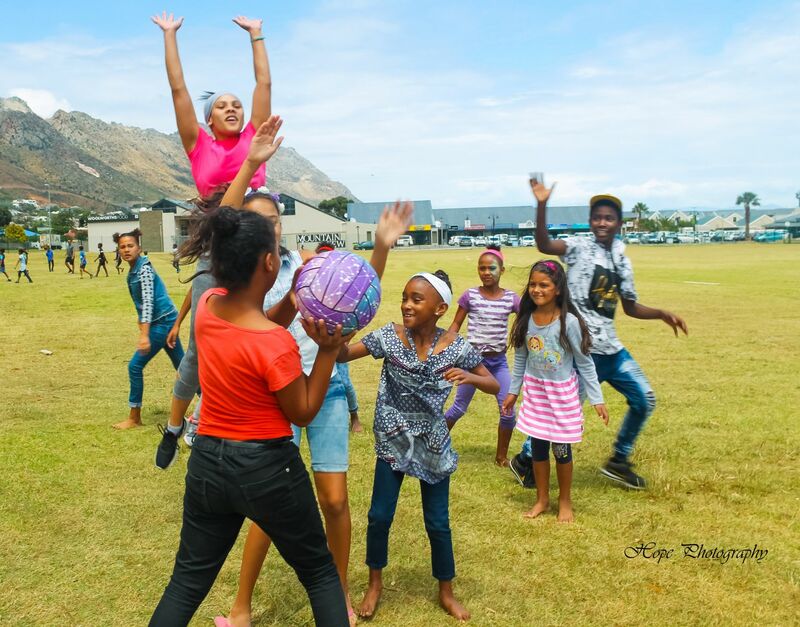 Every year just before Easter the Gordon’s Bay Primary School children collect hundreds of Easter eggs which than will be given to those in need. 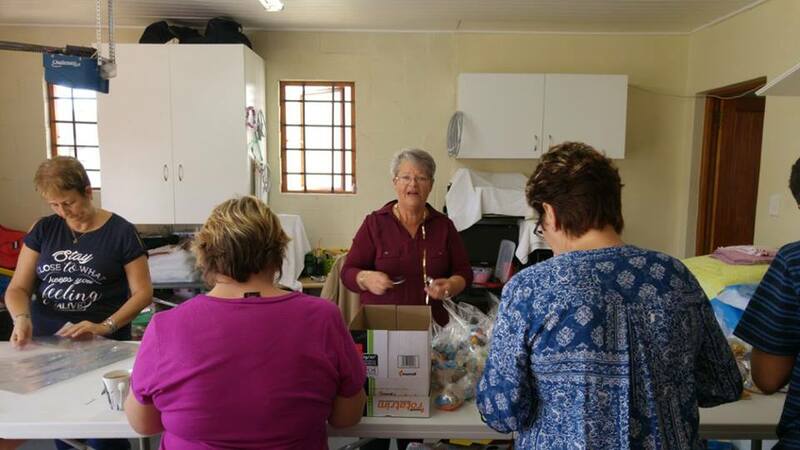 Club members sort and package the eggs for distribution to various local organisations. 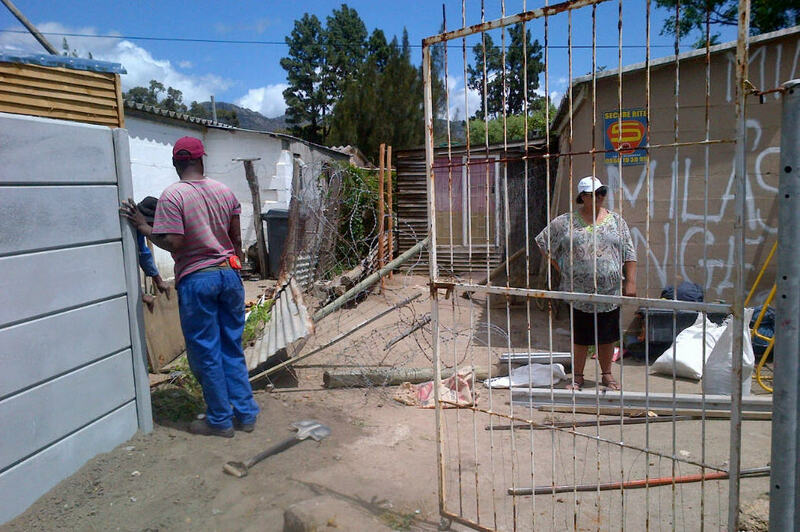 Temperance Town Yellow Door for senior citizens who receive weekly food parcels. 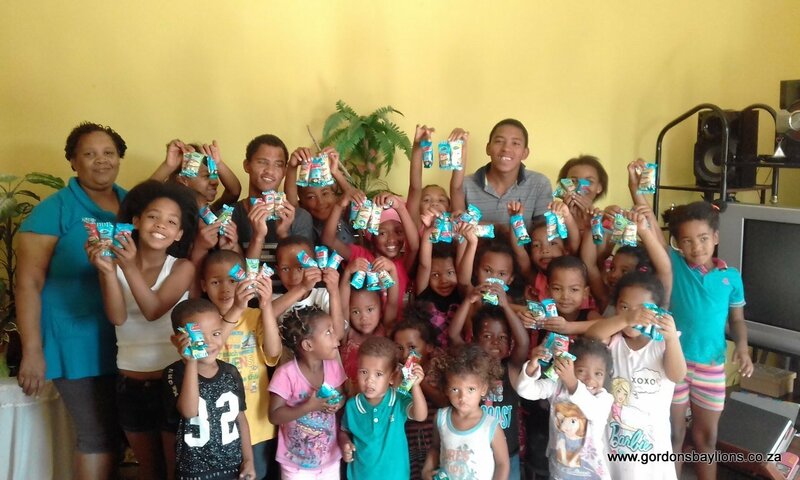 Our work in distributing the Easter Eggs is amply rewarded by seeing the joy and smiles on the faces of those receiving them. 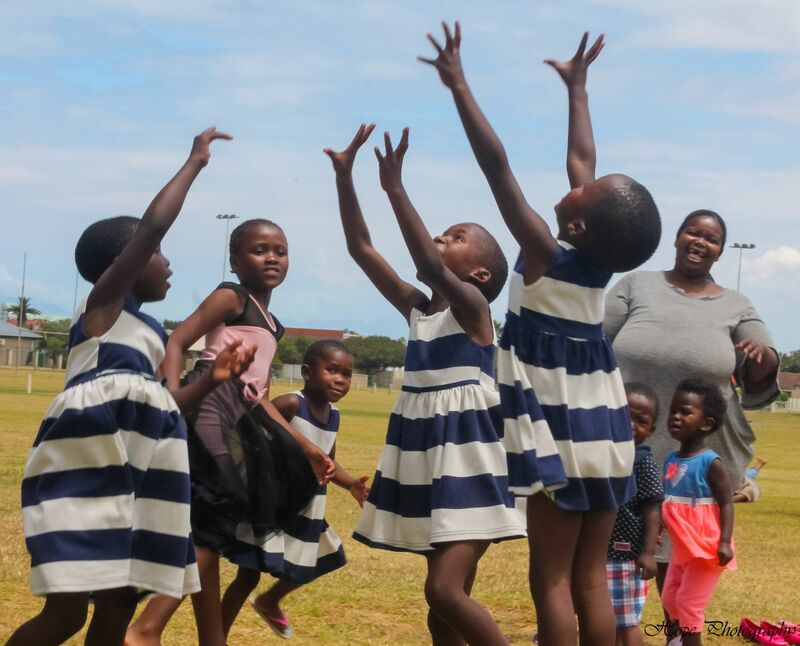 This project is made possible by the Gordon’s Bay Primary School children, directors and teachers, led by Art Teacher Mrs Dennison. 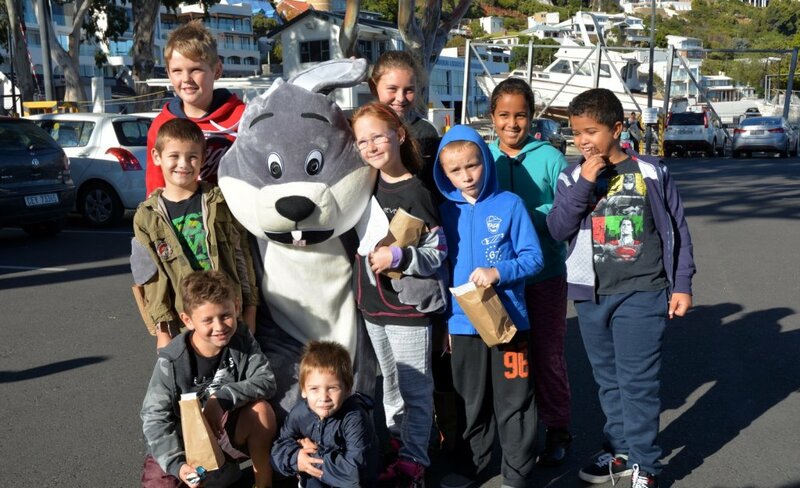 Easter Saturday 2017 was one of our rare sunny and windless days, when 80 children with their family members congregated at the Old Harbour in Gordon’s Bay to take part in the Club's first ever Easter Egg Hunt that we orgainised in cooperation with the NSRI. 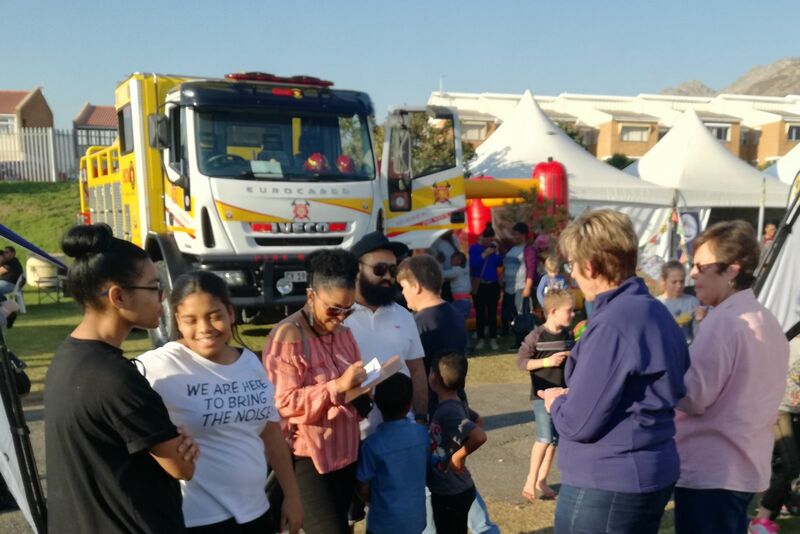 The NSRI Easter Bunny arrived early on a NSRI rescue vessel and soon the excited children swarmed through the Old Harbour area searching for stickers with Easter Motifs. Eighteen different stickers with Easter motifs were needed to be swapped for a bag of Easter Eggs. 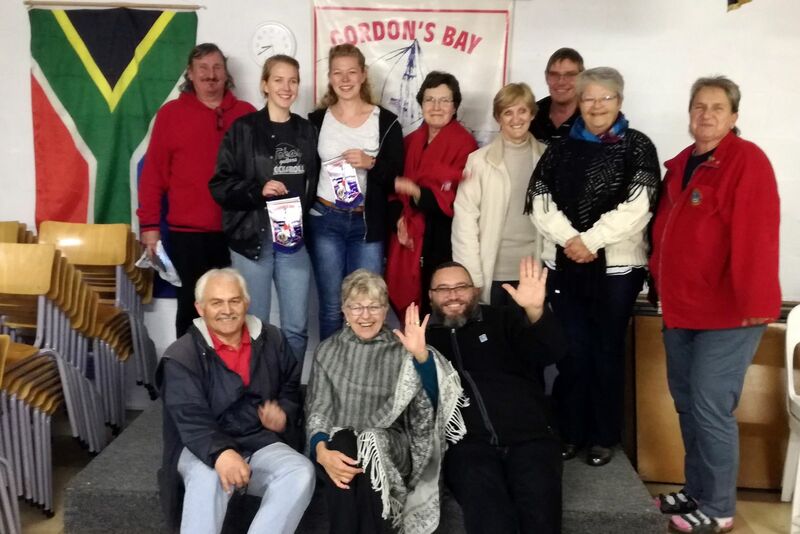 Each bag contained Easter eggs and sweets, donated by members and friends of NSRI station 9 and the Gordon’s Bay Lions Club. 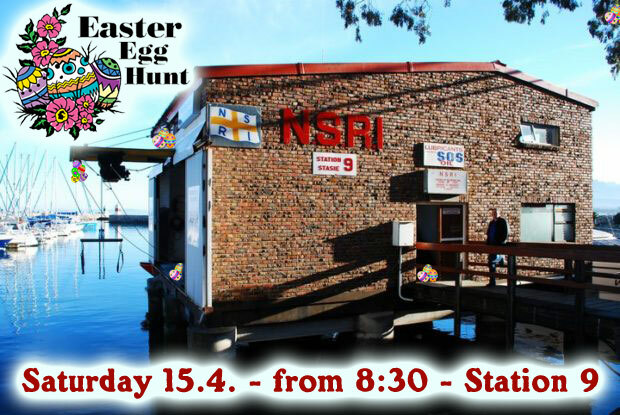 It is intended that our Club will make the Easter Egg Hunt an annual event. 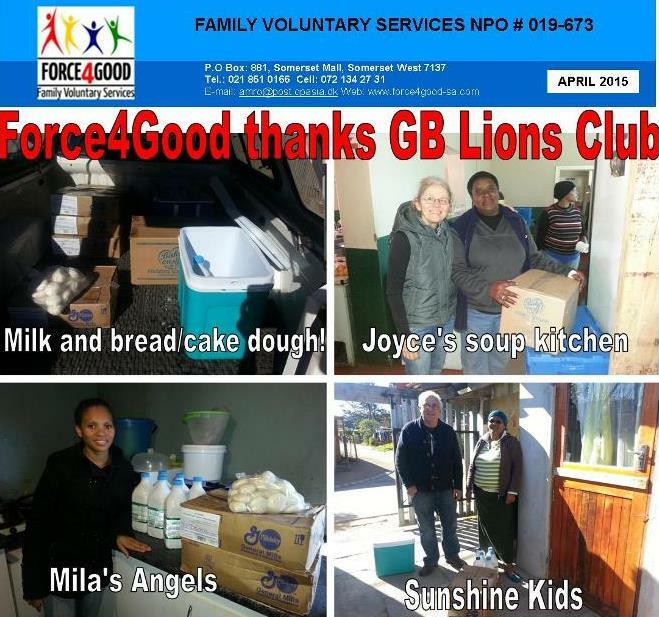 Force4Good is a South African Missionary organisation of volunteers working among the underprivileged to uplift them both physically and spiritually and in so doing spread the Christian gospel. 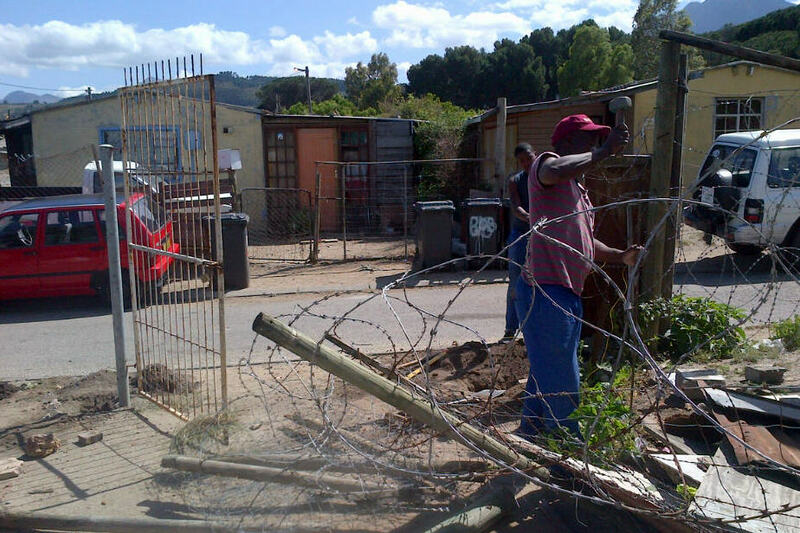 They work in Sir Lowry's Pass Village. 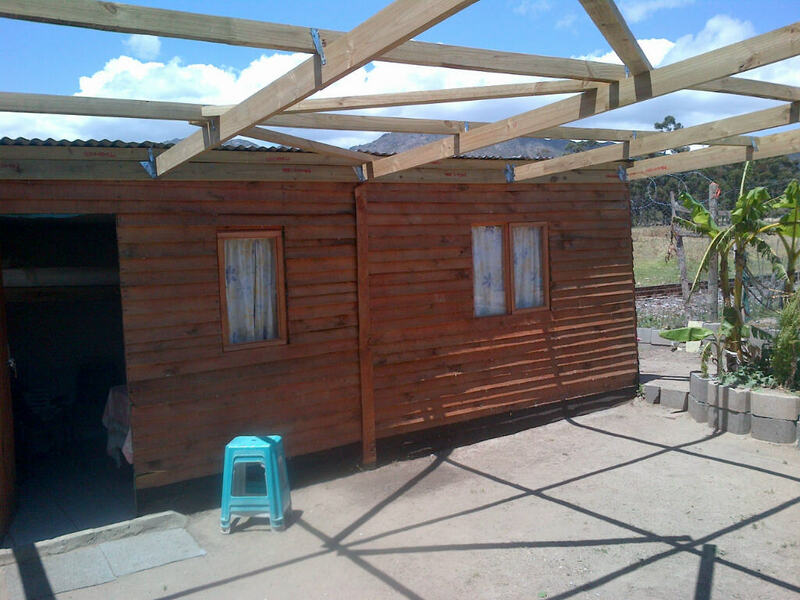 In June 2015 our club donated R5000.00 to enable them to finish off the wendy houses they were erecting for Fiela's Kitchen, a feeding scheme in the village. 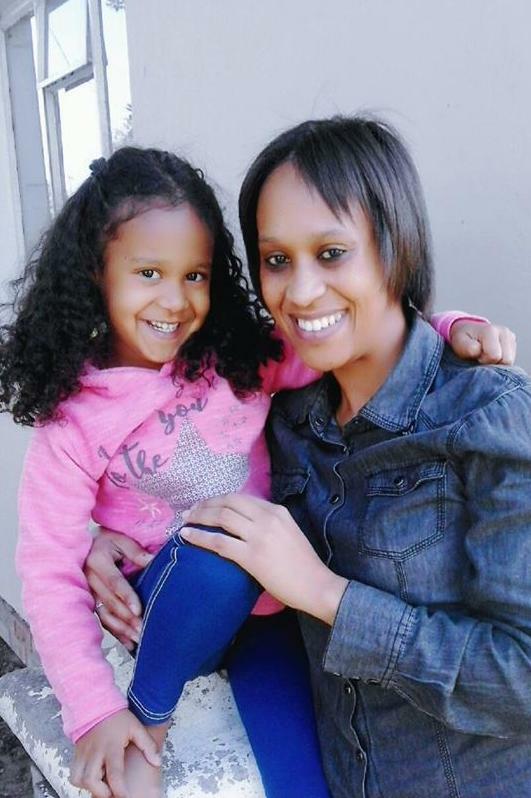 Fiela, a local resident has been cooking meals for needy children in her neighbourhood using her own kitchen to prepare the meals. On 6 August 2015 the official opening of Fiela's Kitchen took place in Sir Lowry’s Pass Village. With the new kitchen facility Fiela is now able to prepare meals for between 150 and 200 children. Apart from supplying the children with food she also keeps the children busy with games, dance and singing and looks after them when they arrive at her kitchen from their homes. 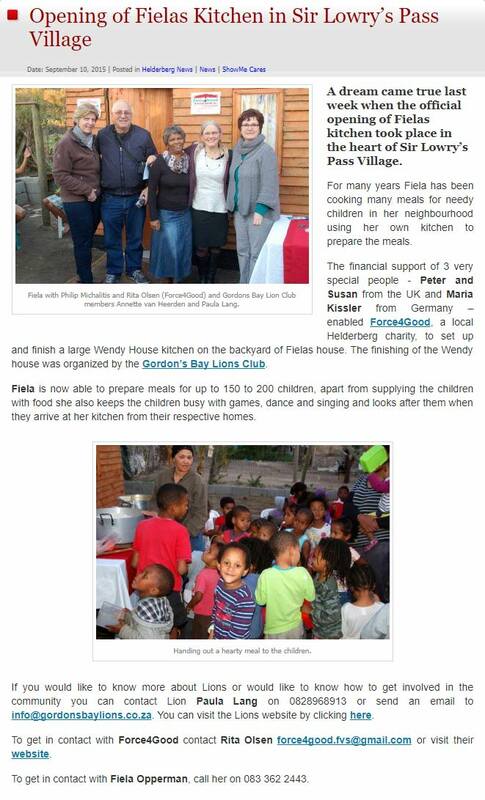 ShowMe Helderberg also published an article about the opening of Fielas kitchen in Sir Lowrys Pass Village. and set up a roof over the feeding and playing area. and Fiela can only feed her children twice a week. 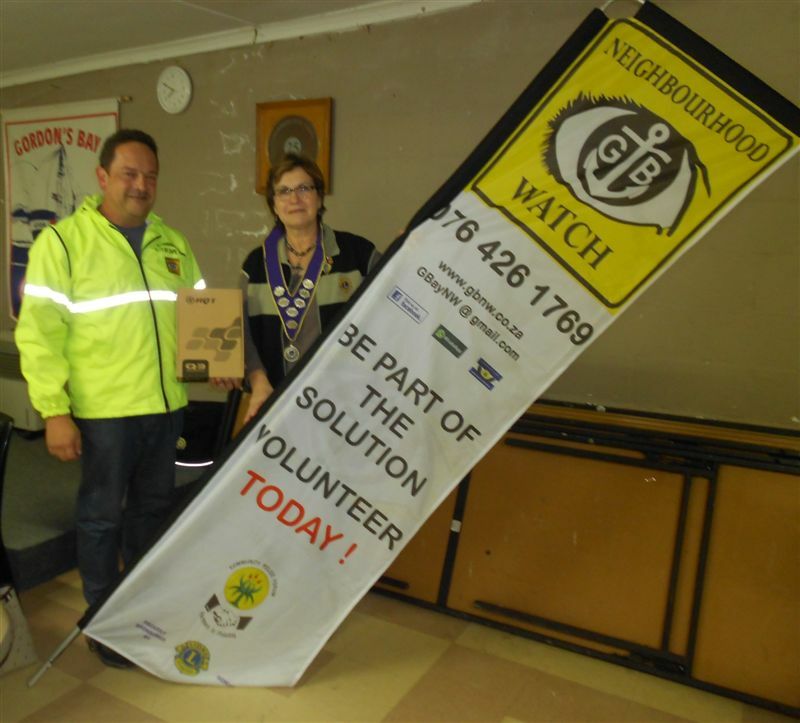 Lion President Paula holding one of the banners presented to a representative from GB Neighbourhood Watch who is holding one of the radios. A few years ago our long term supporters and friends Lions Horst and Heidi from the Bochum Club in Germany attended one of our Club Business Meetings and presented us with some money to assist us with our service projects. 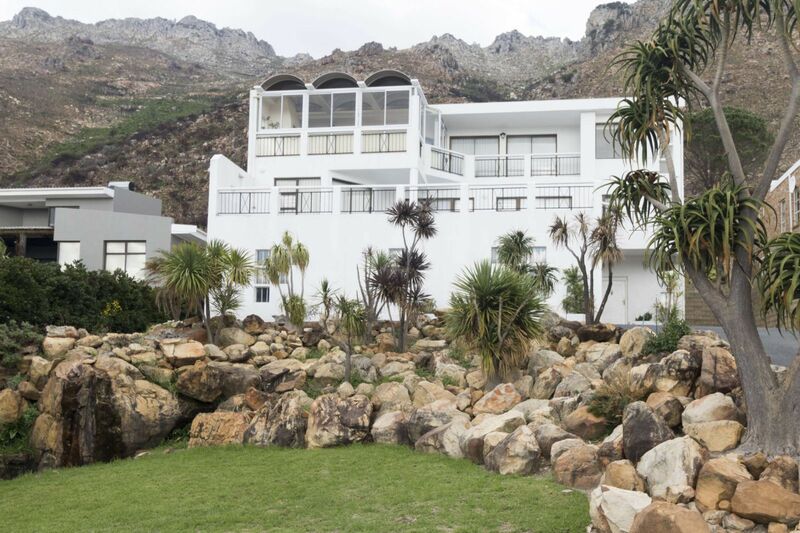 They requested that priority be given to Immanuel’s Haven, a home in Gordon’s Bay for abandoned or abused children. The home could not afford breakfasts for the children so we donated enough breakfast cereals and milk for a month with the undertaking to continue for the next few months until their finances improve. We were told that the children had nowhere to store their personal things so we gave them 100 large plastic containers. Some of the children were in need of shoes so money was made available for the purchase of eight pairs of good quality children’s shoes. We received a ‘thank you’ email from the home which really made us feel that our efforts were worthwhile and that was followed by many more ! 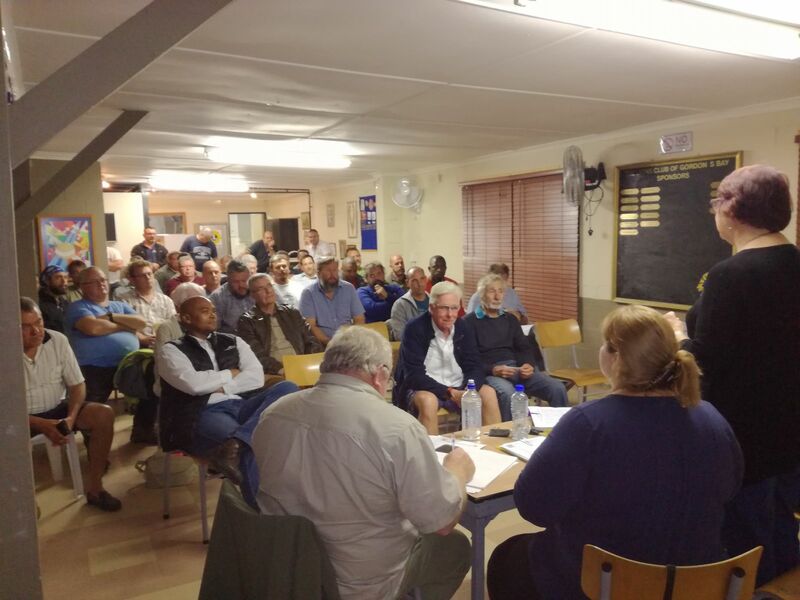 Over the subsequent years our club has continued to provide the home with a monthly supply of milk and breakfast cerials to the value of R1 200 per month. 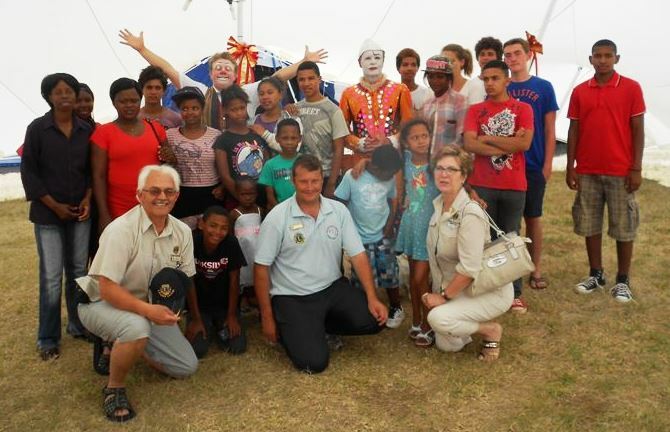 In December 2014 our club invited 21 children from Immanuel's Haven to attend a performance of Brian Boswell's Circus. 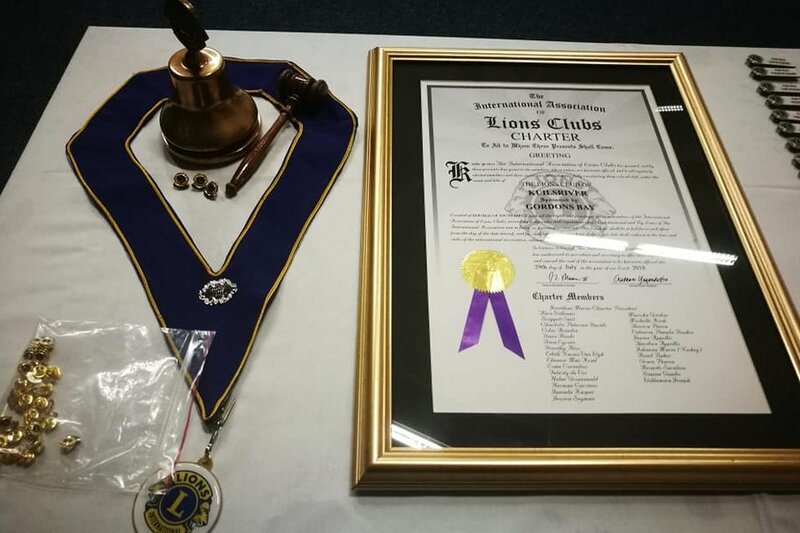 The circus was started by the Brian Boswell's Circus Cyber Lions Club in September 2012 (a branch club of Magaliesburg Lions Club). Most of their projects involve using the circus as a platform to entertain underprivileged children and adults. The children were welcomed by the clowns and Lion Georgina. The children were thrilled with the performers at the circus. 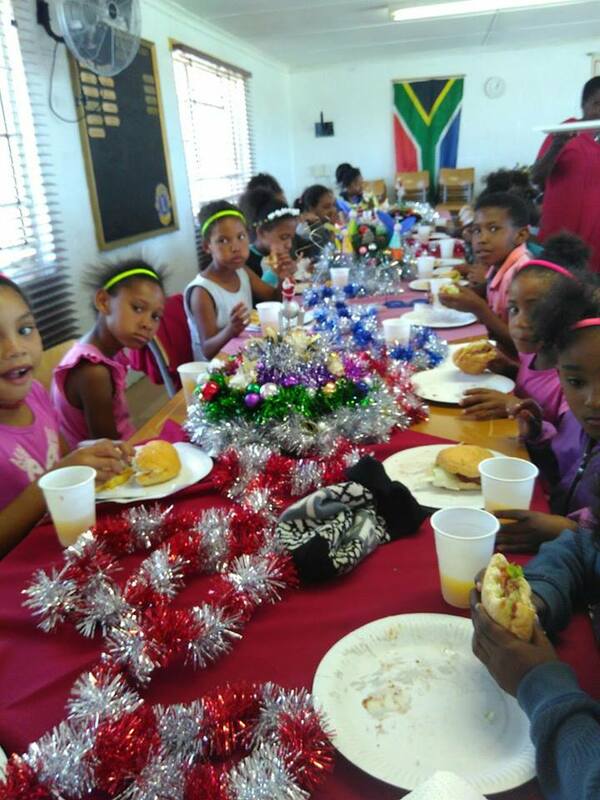 Every year the Lions District 410B, which includes the Western Cape, Northern Cape and Namibia, organises a childrens' Christmas Party at a venue in the Western Cape. Our club has, for many years, been sponsoring, providing transport and chaperoning about a dozen underprivelidged children from the Gordon's Bay area to this event. 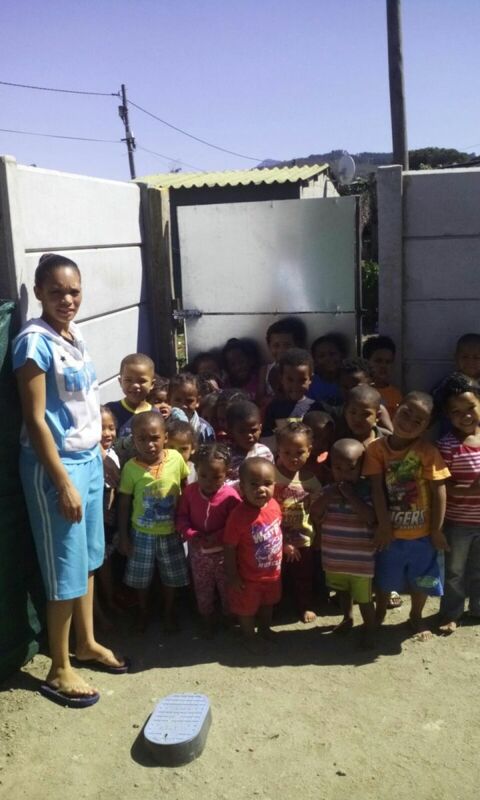 Milas Angels is a crèche at Sir Lowrys Pass village that our club began assissting in 2015. We all know how devastating fires can be, especially in poorer areas where houses and shacks are built from wood and other easy flammable materials. 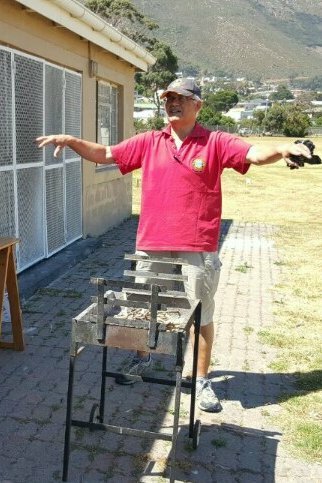 Leonard Carelse, a member of our club is a specialist in fire prevention and fire training. What could be better than to hold the first fire training in January 2016 at the crèche? After being joyfully welcomed by the children and the teachers Leonard explained how to use the different fire extinguishers, what types of fires can arise, what to do if a fire starts in the house, how to warn the neighbours, how to get out of the house, and finally where to meet. The teachers also learned, how to guide the children out of the property and what procedures to perform at a meeting point. 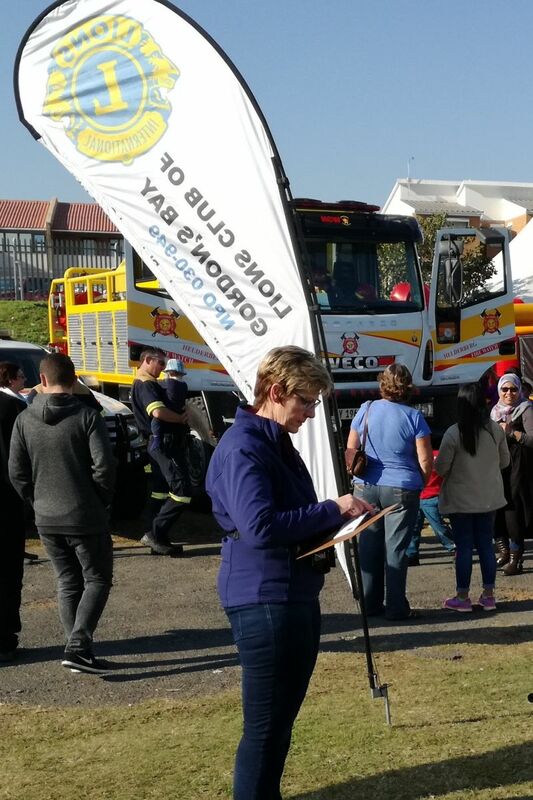 If you would like to hold a fire training at your crèche, kindergarten, pre-school or school, contact Lion Leonard Carelse at 074 360 43 98. Training certificates can also be issued on request. In September 2015 Lions Clubs International announced a Worldwide week to fight Hunger and poverty. 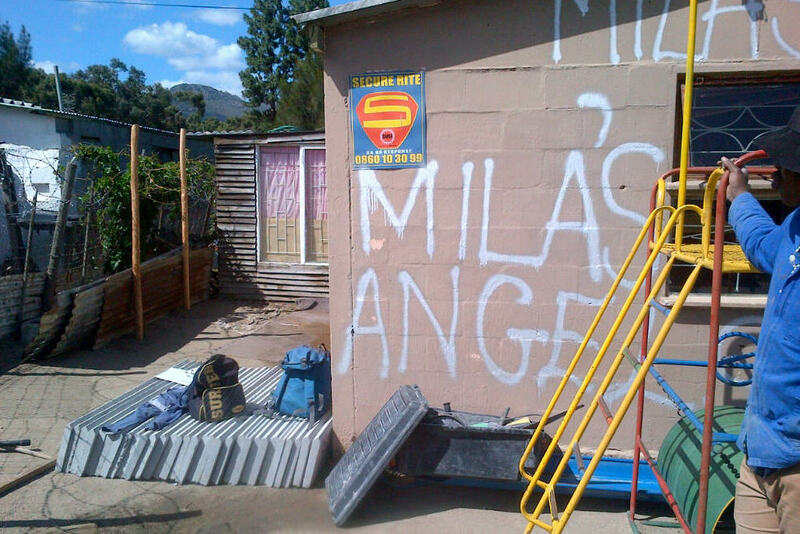 We served a lunch at Mila's Angels crèche in Sir Lowrys Pass Village, Hot Dogs, a juice, a joghurt and fruits. Local charity Force4Good organised a clown for the childrens amusement. 50 children benefitted. Our long-lasting sponsors Horst and Heidi from the Bochum Lions Club (Germany) brought us a donation from German Lion Maria Kissler. Maria asked her friends to give money instead of birthday presents. 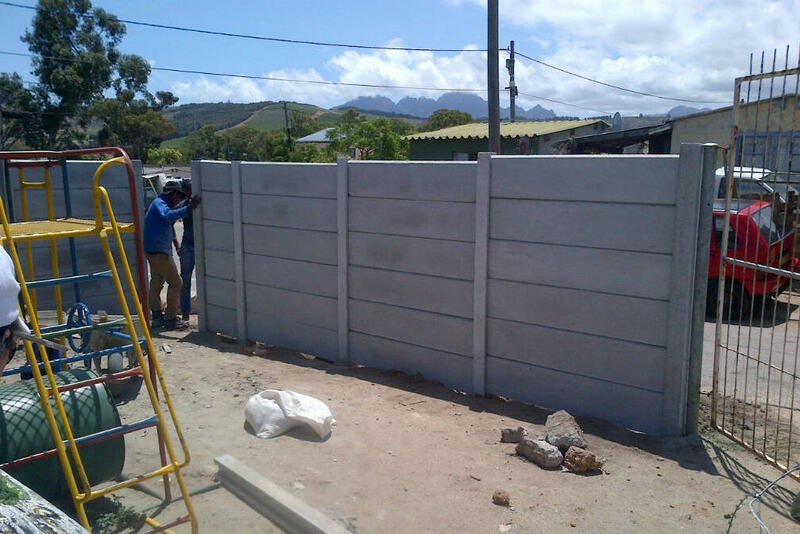 A part of the money was spent to set up a concrete wall in front of Mila's Angeld crèche in Sir Lowrys Pass Village, to prevent someone being hurt when a shooting takes place in the streets and to enable the children to play in the open. 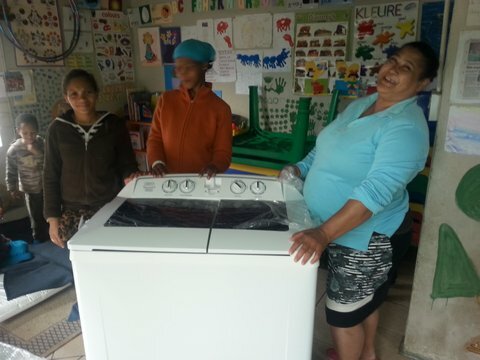 Another part of the money was spent to buy a washing machine for the crèche. 2018: We handed over the new glasses for Cody. With his brilliant character lovely Cody made this day for us unforgettable. 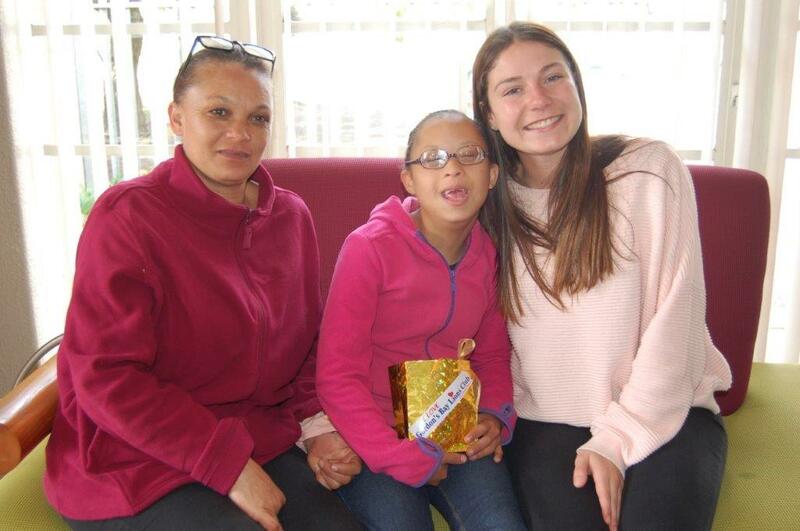 2017: We handed over pair of spectacles to Shanique sitting in the middle with her mother and Cassandra Lang, that went with us to the handover of the spectacles at the Down Syndrome Office in Bellville. Shanique was very happy with her new spectacles this being the second pair that we have arranged for her. 2016: Ouma Adelina, a grandmother from Sir Lowrys Pass Village was helped with a pair of spectacles on a special prescription. She couldn't see anything sharp since many years and was enthrilled to finally clearly see her grandchildren the first time. 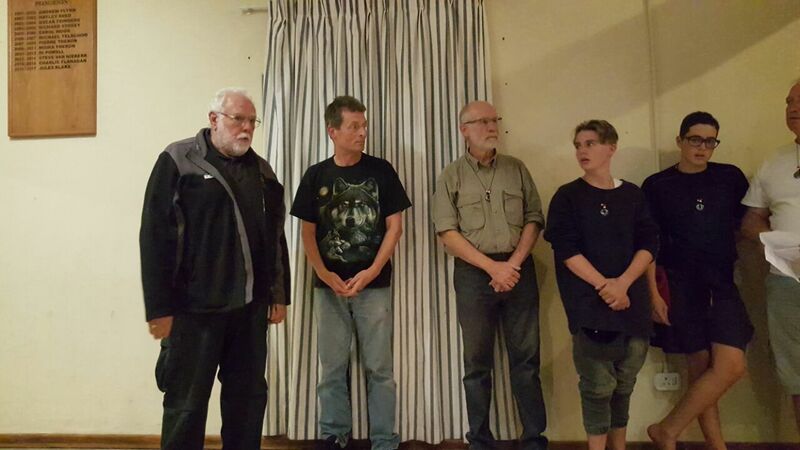 2015: Gerardus, a homeless man, was absolutely delighted to be able to see properly for the first time in many years, thanks to the participation of the Gordons Bay Lions Club in Operation Brightsight. 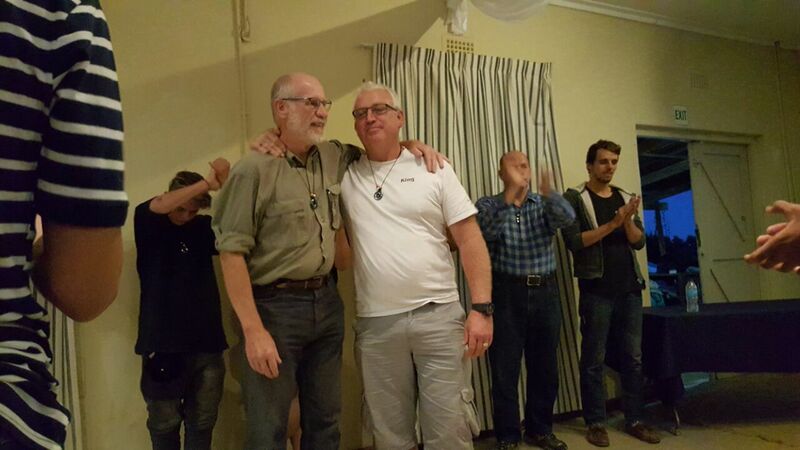 Gerardus wrote a very moving letter to thank us which may be read here. 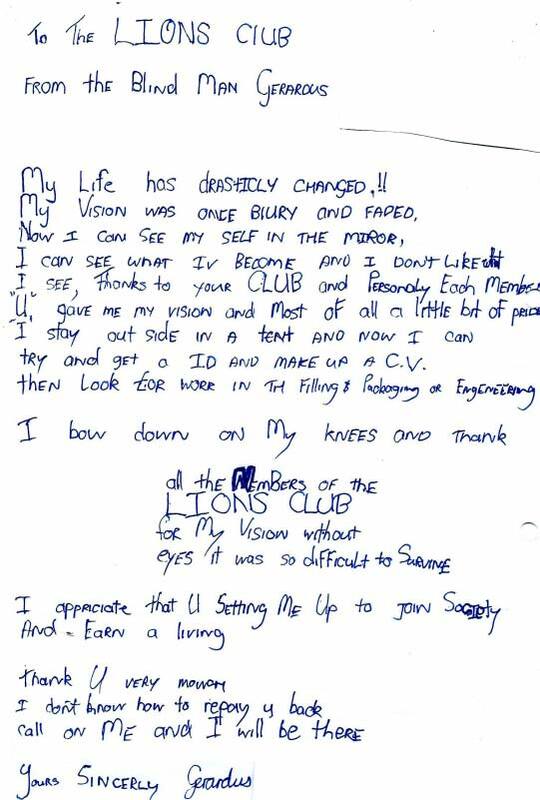 Thank you letter. 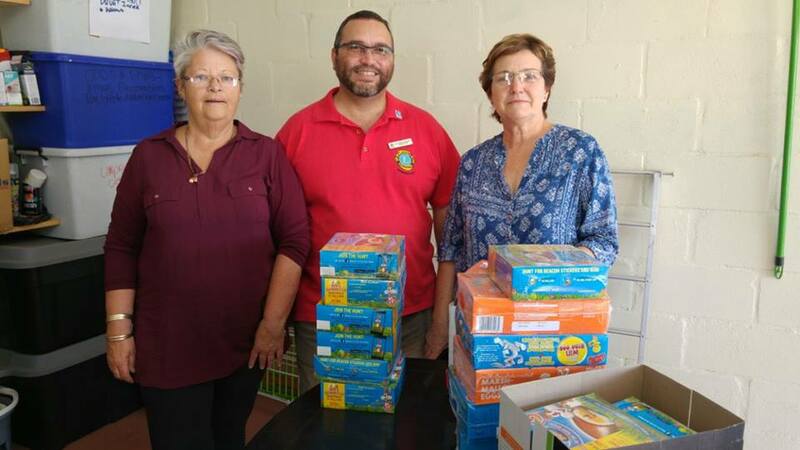 Pinkster Park Church is involved with caring for underpriveledged children and youth in the Helderberg area and our Lions Club has been supporting them for many years. 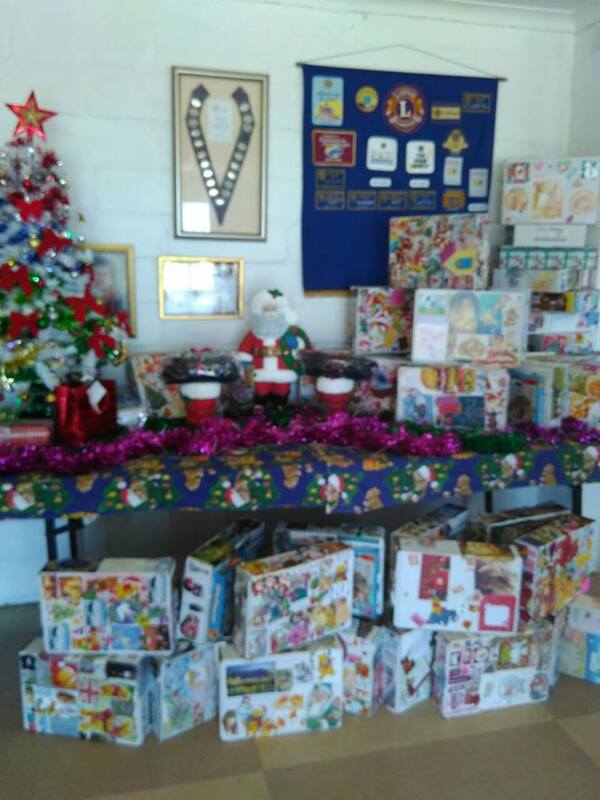 We regularly supply Christmas hamper for the children. 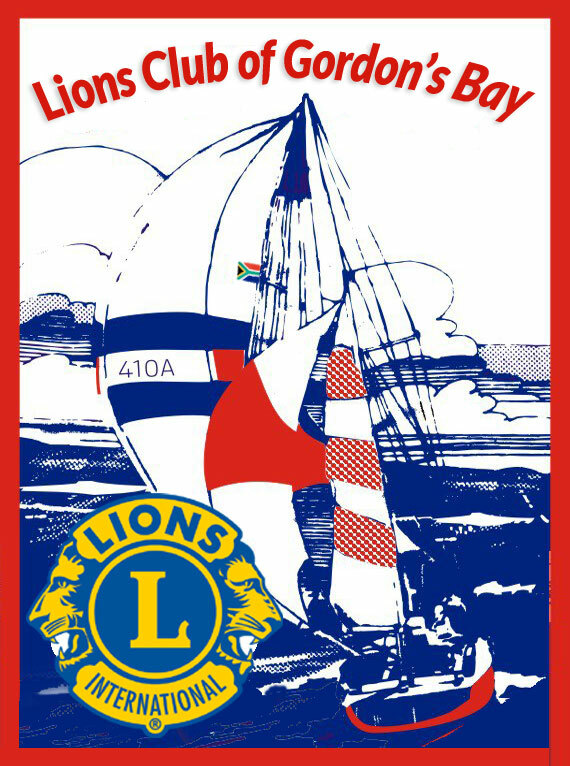 The contents of the hampers is donated by the SA Navy College in Gordon's Bay and also purchased by us using funds raised by our club. We pack and deliver the hampers to the church shortly before Christmas. 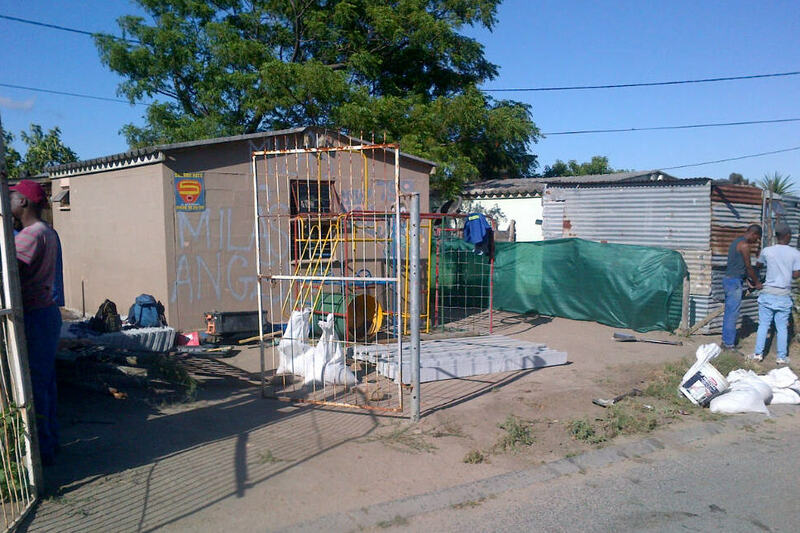 We delivered 15 boxes at the value of R 10.000 to Pinkster Park. A big Thank You to Cammy and Jose' Fernandez from Gordons Bay Spar that gave the goods to us at reduced prices and packed the boxes for us. The boxes made the distribution so much easier for us. 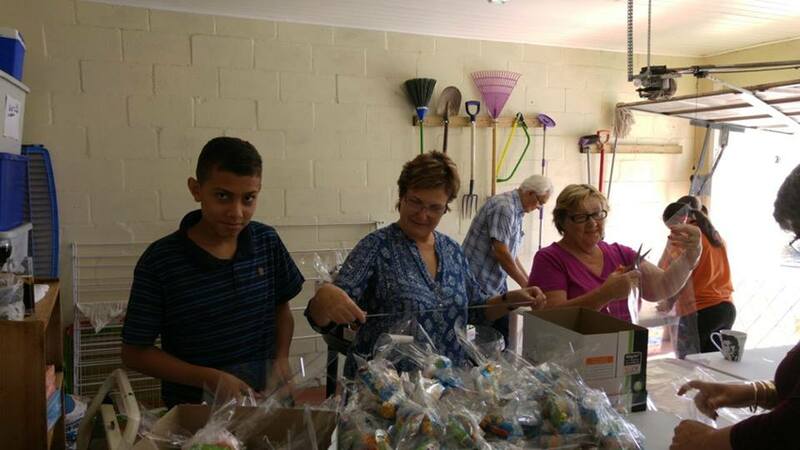 Gordon's Bay Lions Club members packing hampers bags for the distribution before Christmas. 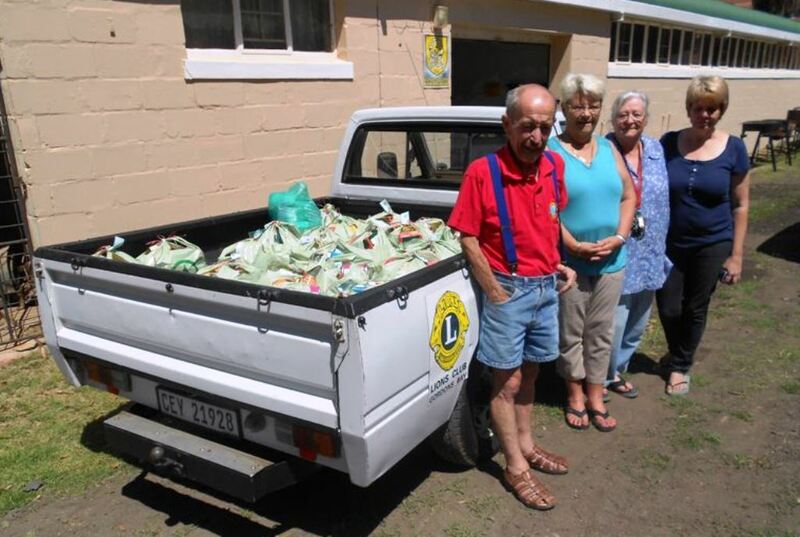 Late Lion Colin and Lion Michele are standing with Vivian and colleague from Pinkster Park with the hampers delivered in December 2015. 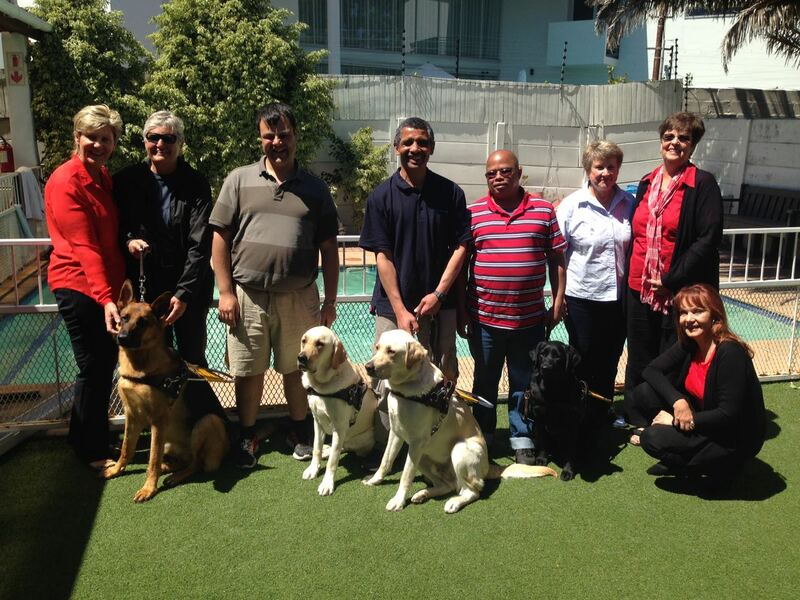 In 2013 and again in 2015 the Gordon's Bay Lions Club donated R10 000 for a Bronze Sponsorship for a Guide Dog to the SA Guide Dogs Association to pay for the acquisition and training of a dog for the use of a needy blind person. The dog receives one year of intensive training and assessment, after which a needy blind person is chosen to receive the dog. 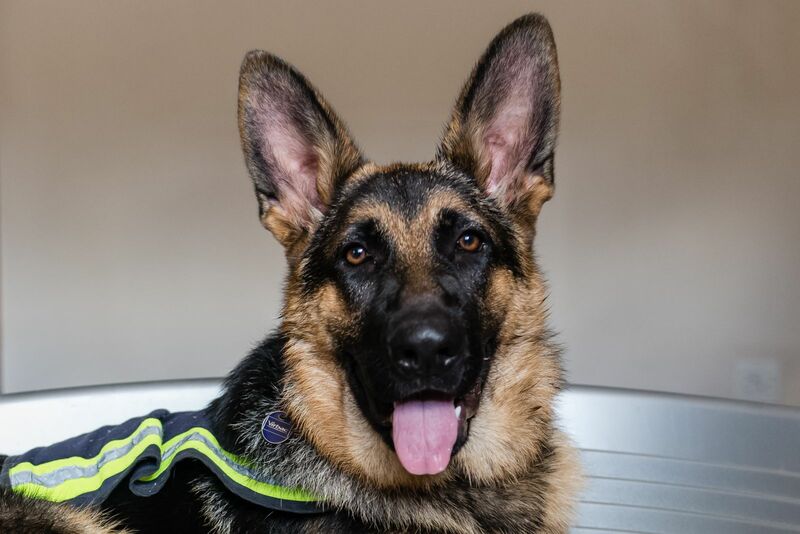 When the blind recipient and the dog have been suitably paired the new owner also undergoes thorough training in handling and care of the dog in preparation for their new life of independent mobility until both owner and dog are completely comfortable and confident. 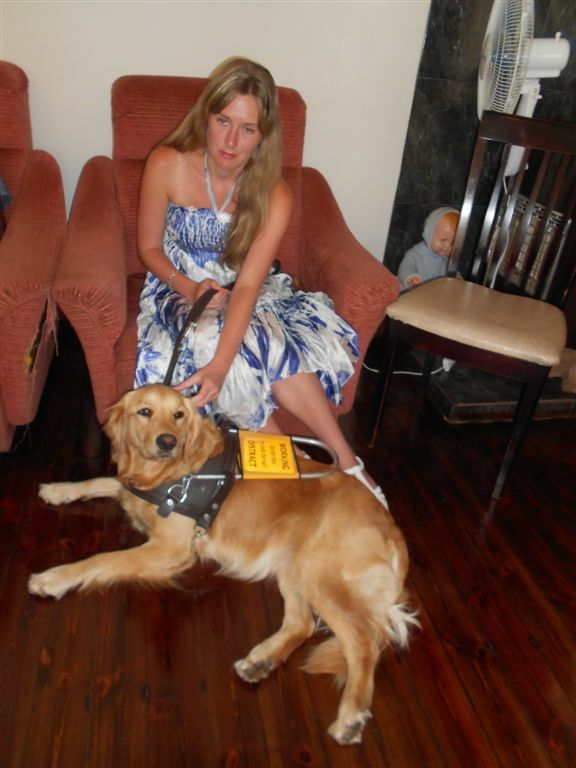 For 2017/18 we budgeted to donate a further R10.000 to sponsor another Guide Dog. 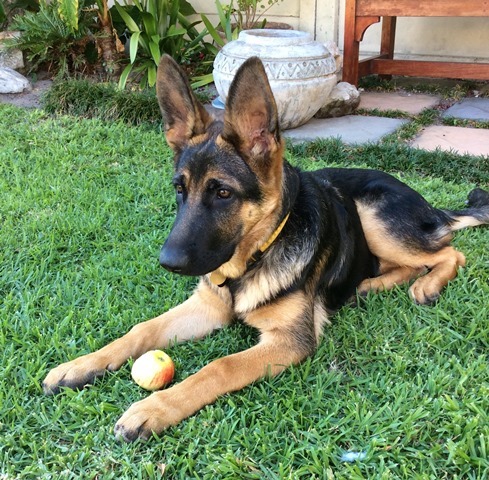 At nearly 10 months old, Zeta has grown into becoming the sweetest little lady. 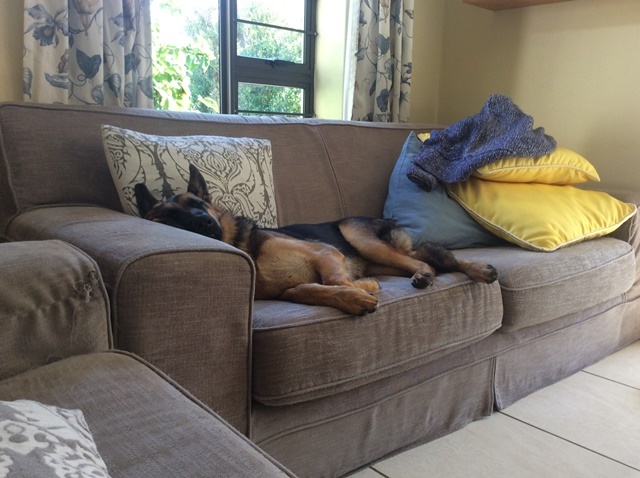 She loves playing with other dogs - on lead or off lead, loves little children - always greets them with a big wet kiss. I have not noticed any aggressive behaviour from her - only submissive actions. 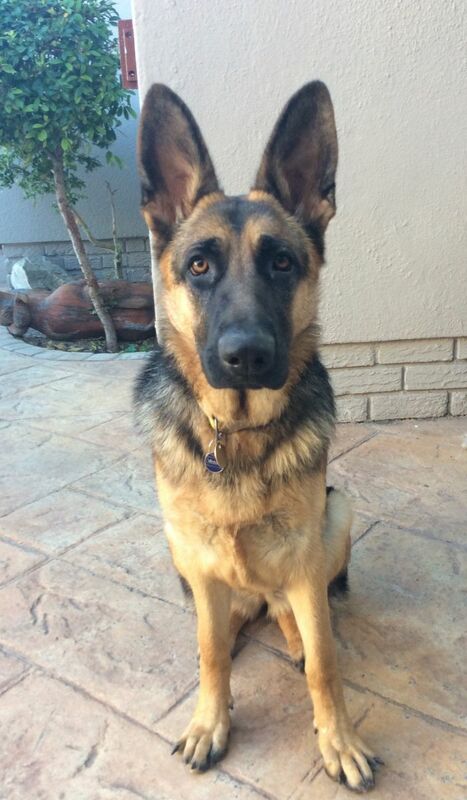 Zeta is very eager to go for car rides and walks through shopping centres - and she walks beautifully next to me. At night time Zeta is so good - busy busy time at 21h00, sleep time follows and 6:00 is wake up time - time to once again busy busy. "ZETA" awas sponsored in 2015. Zeta is progressing well. Loves car rides and still lies curled up on the front floor, socializes well with other dogs, interacts with all adult races and is very gentle with toddlers and children. Zeta also walks beautifully on lead, but does tend to stop and stare at the noisy duck. Through shopping malls she also behaves very well but I do find she still goes far too quickly downstairs. She has no problem with rotating doors or lifts. 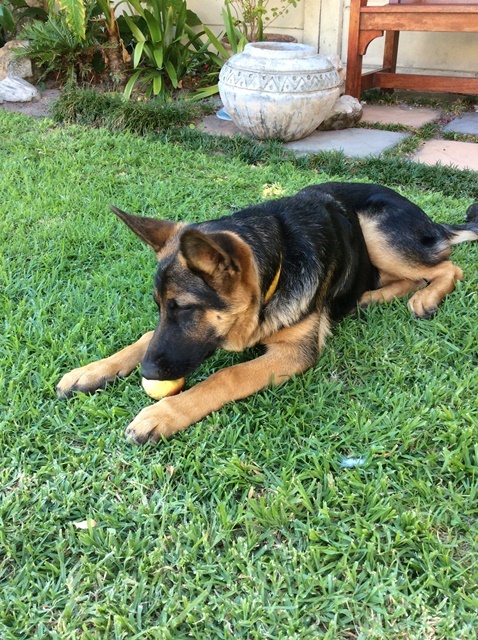 Her obedience commands are also progressing very well. She does a really good sit/lie stay . She has even started sitting when I open doors . I personally think she is going to make a very good guide dog. Thank you again for your support and making it possible for us to continue the work we do in our community. 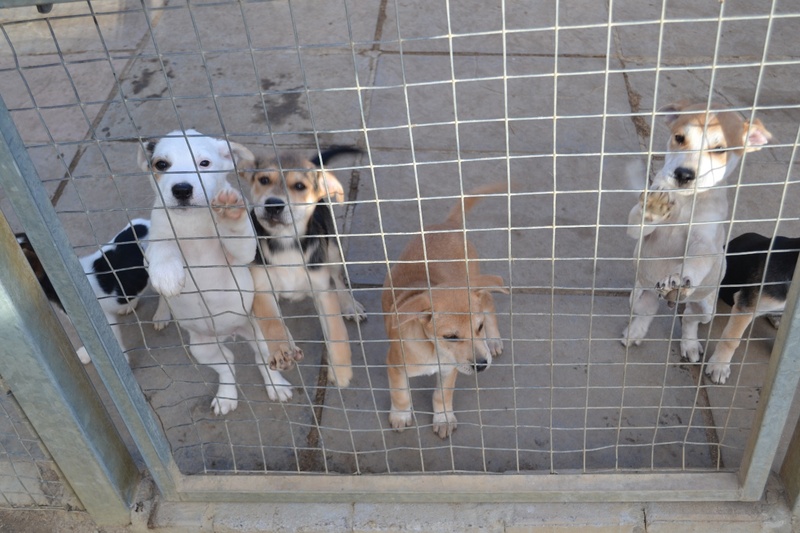 The second dog was handed over in 2016. 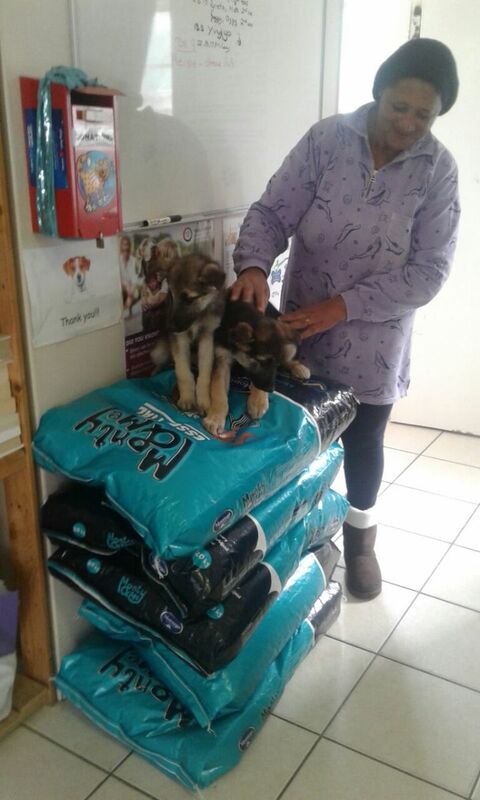 The handing over of our first dog "Tess" to the new owner took place in February 2014. Sydney who received "our dog" is blind and this is her first guide dog. Lion Mike Mulcahy, Lion Grant Jonathan and Lion President Paula Lang with the photograph of our 2013 dog "Tess". 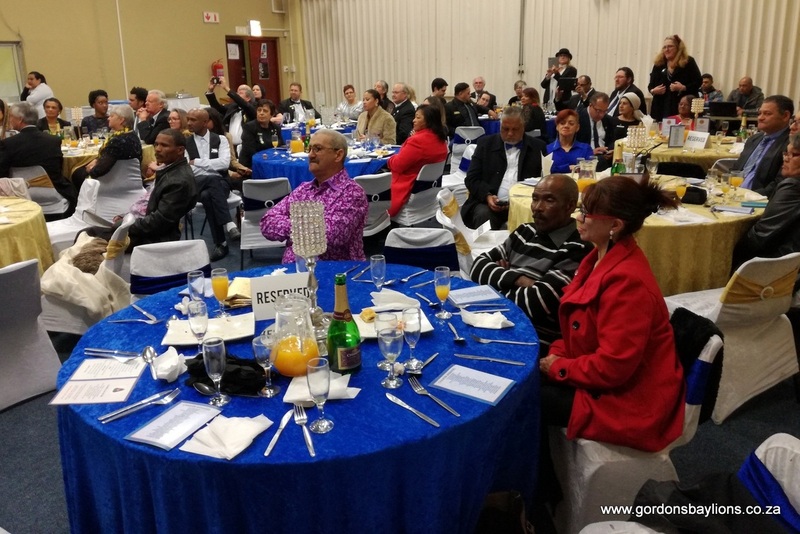 Our club has supported the Sensit Old Age Home in Gordon's Bay for many years with braais and tea parties to entertain the residents often with live music and dancing. 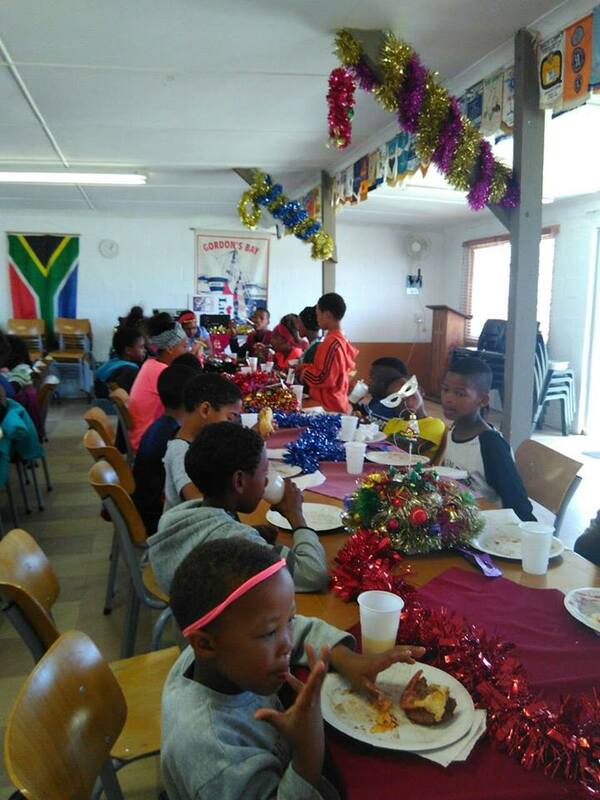 In November 2016 our club hosted a Christmas lunch at our clubhouse for 45 residents of Sencit Old Age Home together with some elderly residents from Temperance Town and Sir Lowry’s Pass Village. 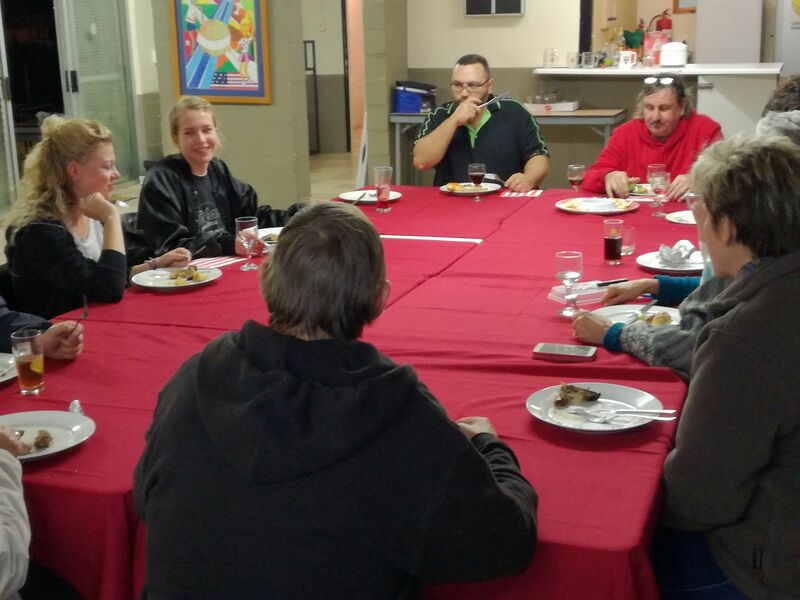 Our guests were served a three course Christmas dinner prepared by our members. 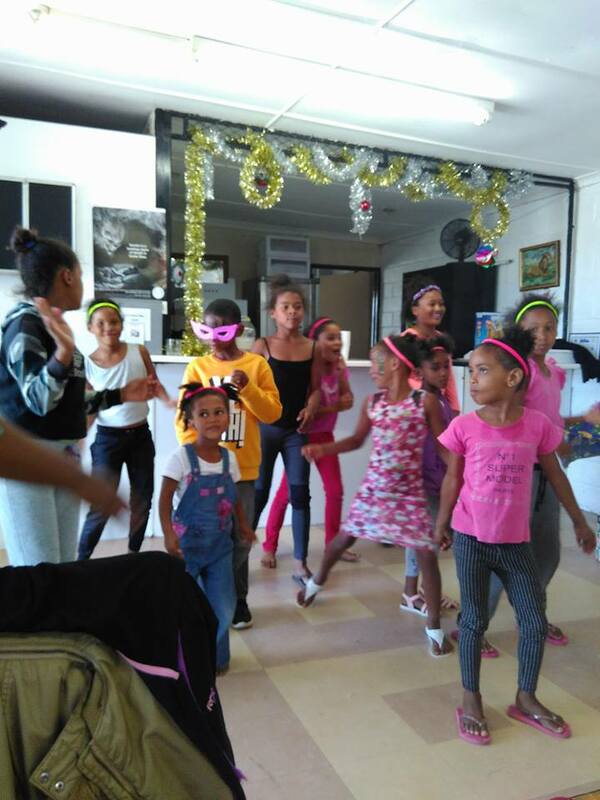 They were entertained by children from Mila’s Angels ECD Centre Sir Lowry’s Pass Village with music provided by our Lion DJ Pieta. Christmas gifts were distributed to all our guests and the children. 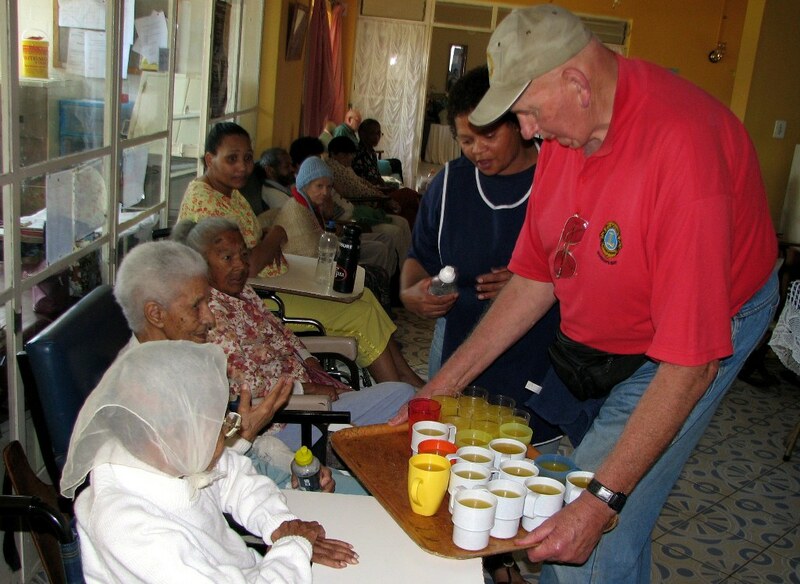 Club members serve residents of Sensit Old Age Home juice and other drinks during a club visit. Every time club members have any magazines available or games, we stop and deliver those items to the home. Our support will be ongoing in the future and you can support us. 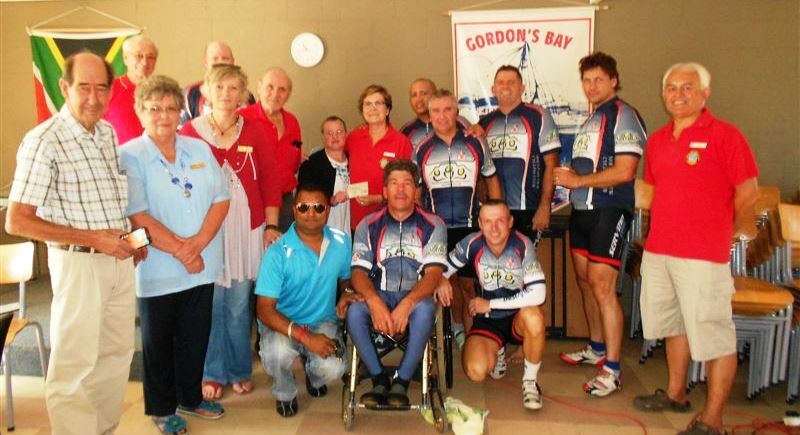 Read more about DONATING TO THE GORDON'S BAY LIONS CLUB HERE. 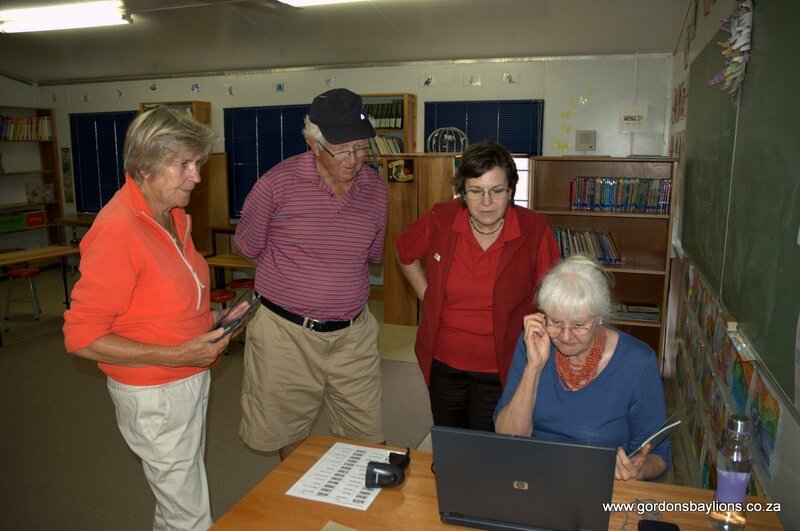 Our trusted sponsors Lions Horst and Heidi from the Bochum Lions Club visiting the Temperance Town School Library during their yearly visit in Gordon's Bay in March 2018. Fifty years ago, UNESCO officially proclaimed 8th September as International Literacy Day to mobilise the international community to promote literacy as an instrument of empowermenet for individuals, communities and societies. 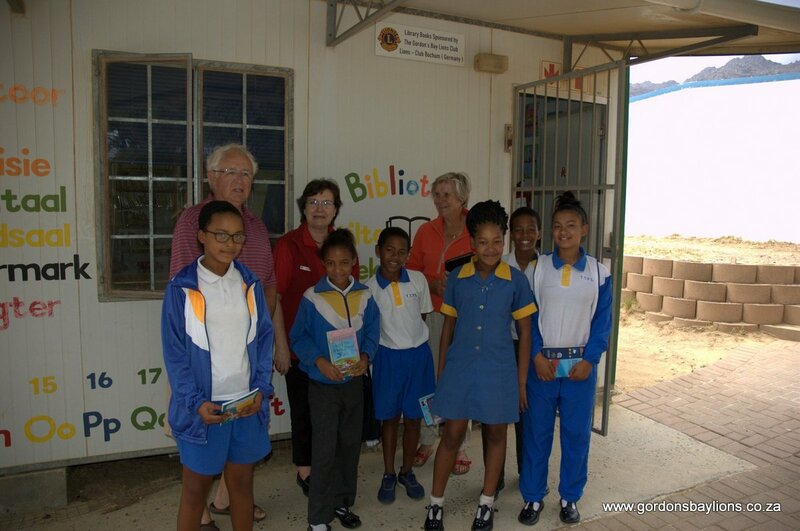 The Gordon's Bay Lions Club has supported the library at the Temperance Town Primary School from its inception in 2008 and recently donated R 5000 for books to cater for a growing number of pupils. To celebrate International Literacy Day, Lions club members organised a reading marathon at the library at the 8th September 17. More than thirty enthusiastic pupils read from their favourite books for three hours - without any break - and each of them received a reading certificate. 7.8.2017 - Book Donation: The pictures underneath show librarian Jeanette Kruger, Lion Paula Lang, school principal Mrs Windvogel and Lion Jenny Davies at the presentation of the books. 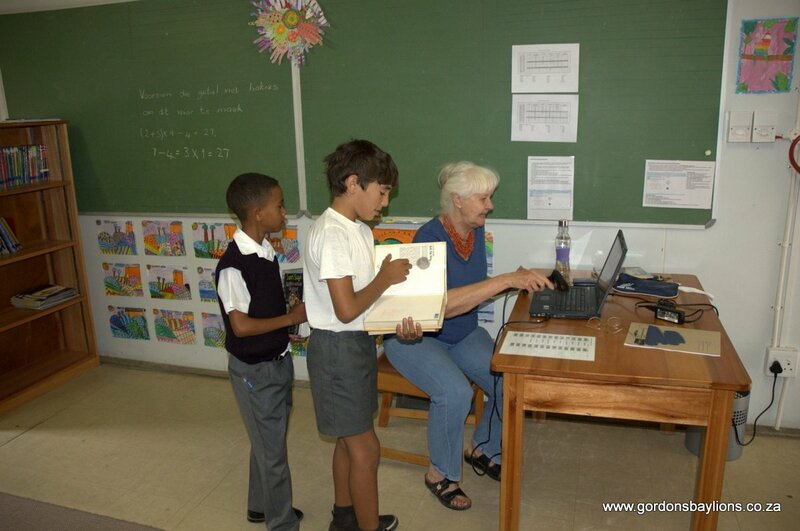 Only 10 minutes later the first pupils came in and took note of the new books. The library has now 3500 books available and almost 10.000 books have been lent out since the computer system was installed a year ago. The number of pupils has recently risen to 1000. We are thankful for any - once-off or continuous - donation or donation in kind. Please contact us HERE for more information about DONATIONS. On Friday the 8th of April 2016 a new Toy Library for pre-school toddlers was opened by the school principal Ms Windvogel. Our club sponsored this facility with R 10.000. Mrs Windvoel said the Toy Library would play a crucial role in shaping the future development of the pre-school children. This event was attended by mothers and their toddlers for a play session after the opening and the little ones enjoyed the experience playing with the toys. 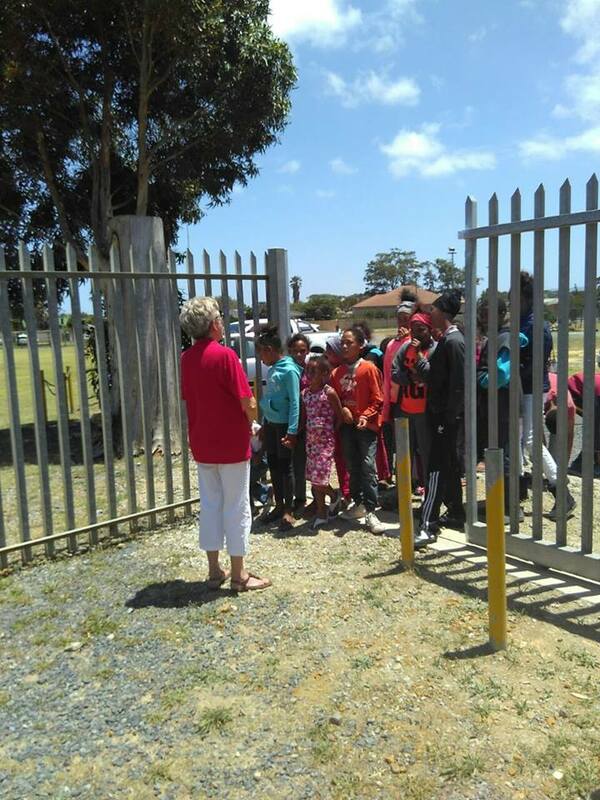 Jeanette Kruger, the librarian, expressed her gratitude to all the sponsors who contributed towards the Toy Library. Due to being so popular the Toy Library has recently been moved to the Gordon's Bay Library. 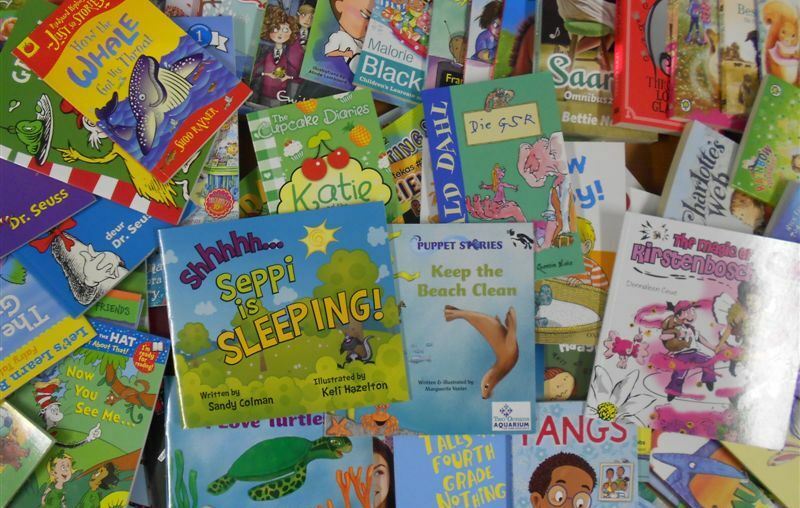 In August 2013 our Club donated R5000 worth of books to the school library for the use of the children in Grades 1 and 2 at Temperance Town Primary School. The same amount of money was again donated in January 2014 and again in June 2015. Education is one of the most important projects to the Lions and these children will now have the opportunity to begin to read at the very start of their school careers. Thanks to the school librarian, Mrs Jeanette Kruger, for spending her time in selecting appropriate books and to Wordsworth Books at Somerset Mall for their help and generosity in giving a welcome discount as well as supplying some extra books. 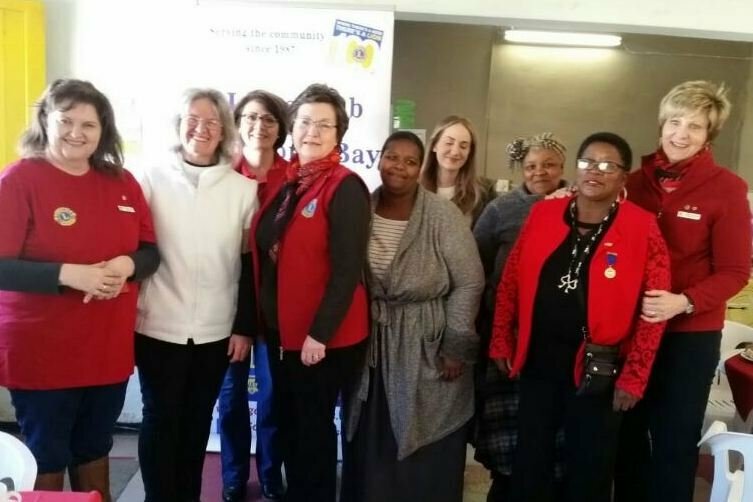 Our club has supported this project over the last three years and we have donated more than R25,000 worth of books with the assistance and financial support of the Lions Club Bochum in Germany. 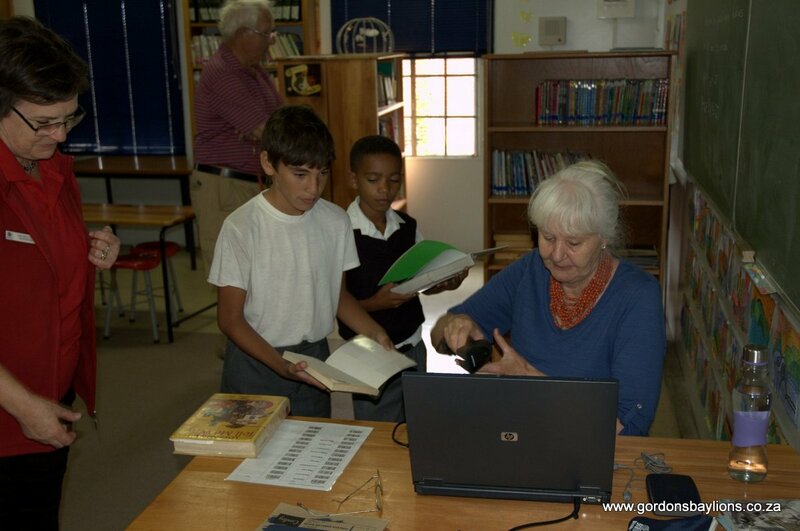 In October 2014 our club made a further donation of a computer valued at approximetely R8,000 to assist the school with managing the library and the books. 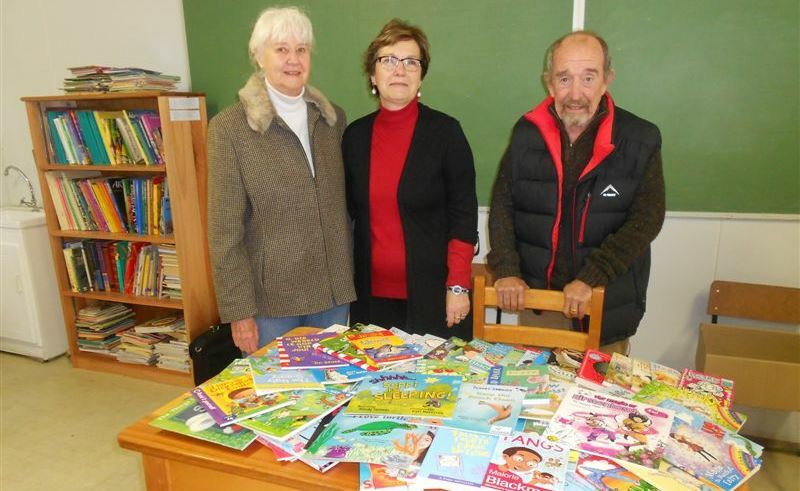 Jeanette Kruger, Temperance Town School Librarian with Lion President Paula Lang and Lion Colin Pratt with school books to the value of R5000.00 donated in June 2015. 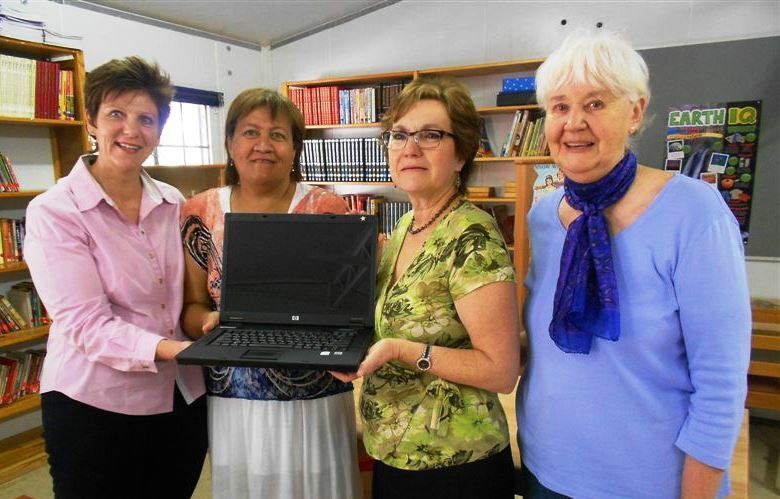 Handover of the Laptop Computer to Temperance Town School library in October 2014: In the picture is Lion Annette van Heerden, schoolteacher Mary Anne Meyer; Lion President Paula Lang and School Librarian Jeanette Kruger. 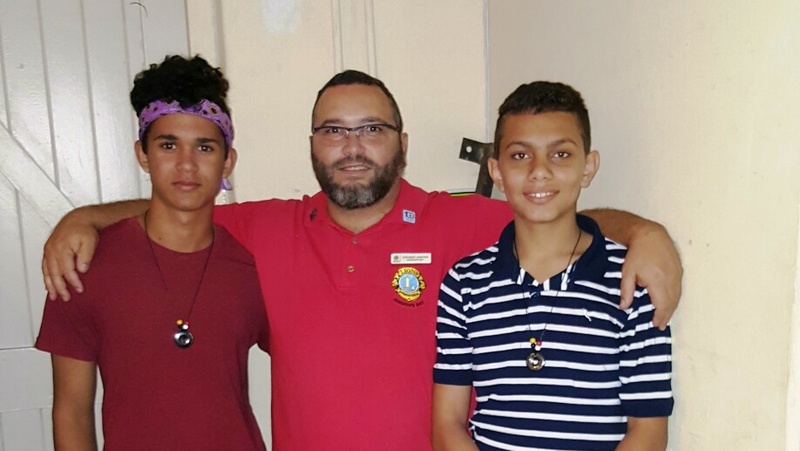 The Lions International Youth Camp and Exchange Program is life-changing for the participants. 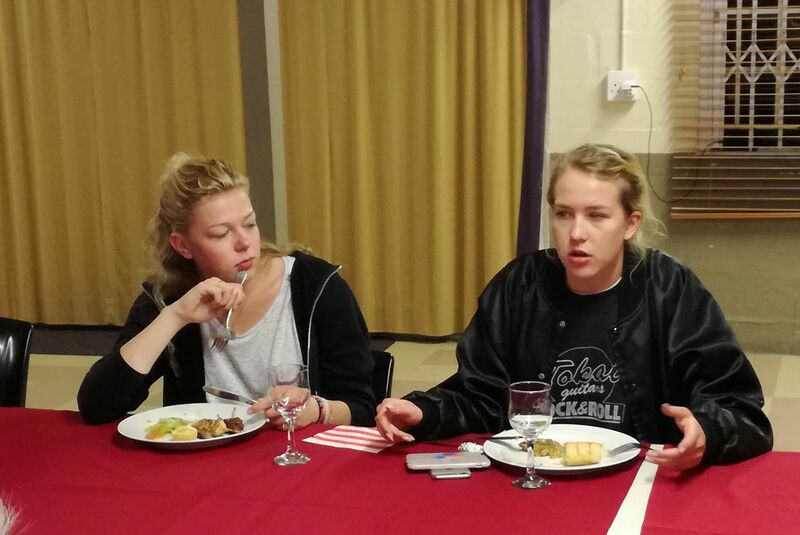 Youth exchange participants have a unique cultural learning experience whether in their own country or travelling to another, living with a host family. 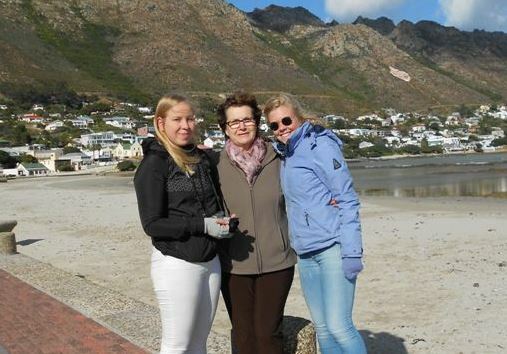 In July 2015 our club hosted two students, Heikki Honkola from Finland and Maartjie Mom from the Netherlands. 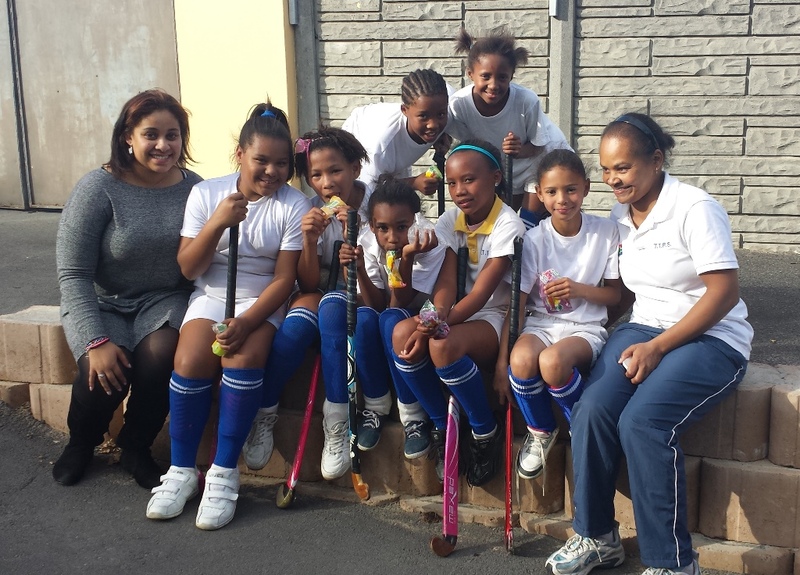 Seen with Lion Paula Lang, centre, who accommodated and entertained the girls. 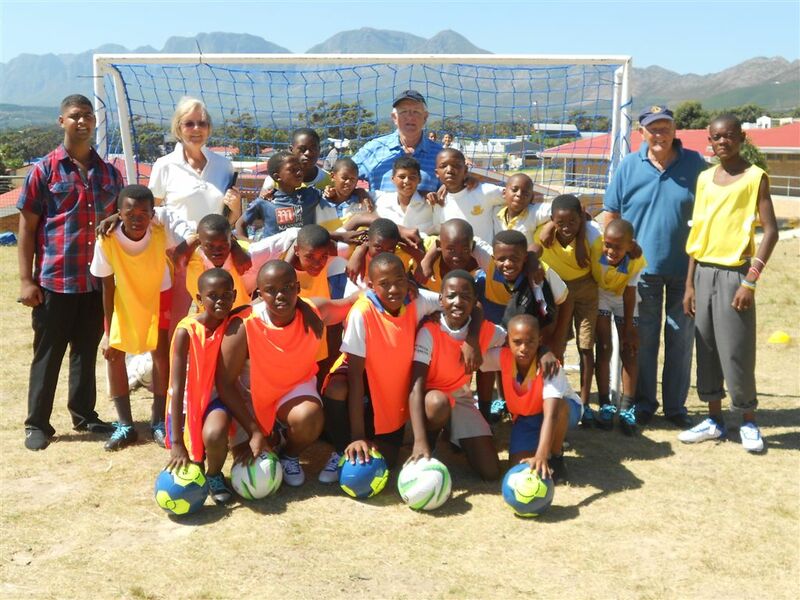 In June 2008 a group of sixteen disadvantaged boys from Temperance Town Primary School were encouraged and helped by members of the Gordon's Bay Lions Club to form a soccer club. In 2011 the Lions Clubs of Oslo Roa and Berlin Potsdamerplatz agreed to fund the Soccer and Hockey Clubs at the school for a period of at least three years. 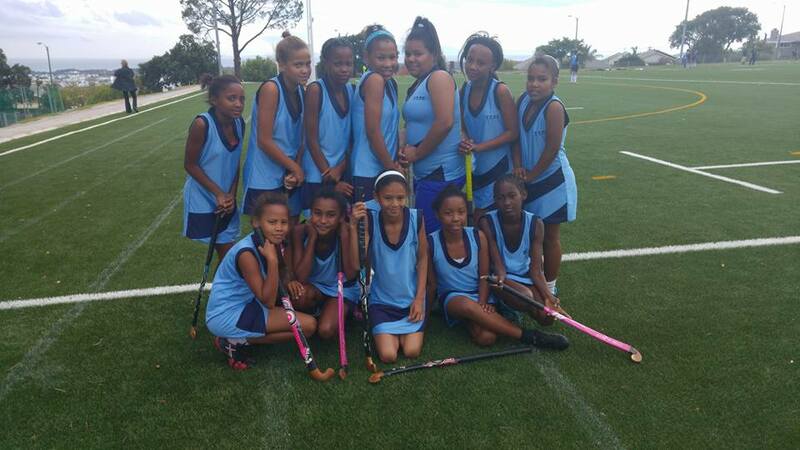 On 21 May 2015, our team played against De Hoop Primary School in Somerset West and beat them 5 - 0. 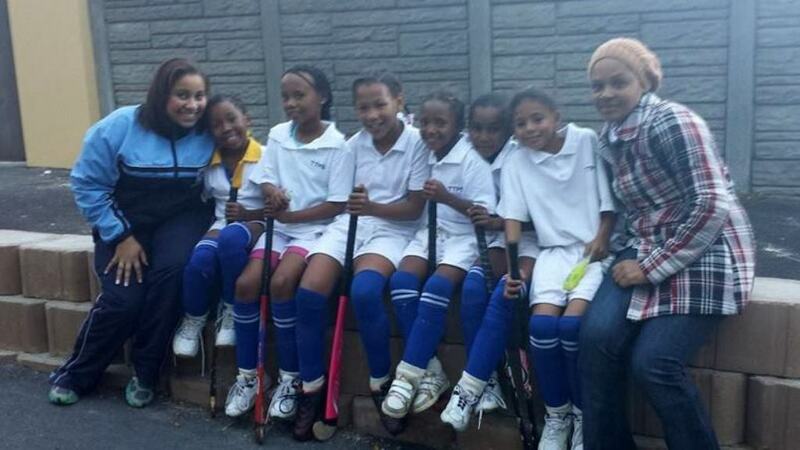 This is the second time our team played De Hoop and beat them 5 - 0 on both occasions. We are indeed so proud of our team. 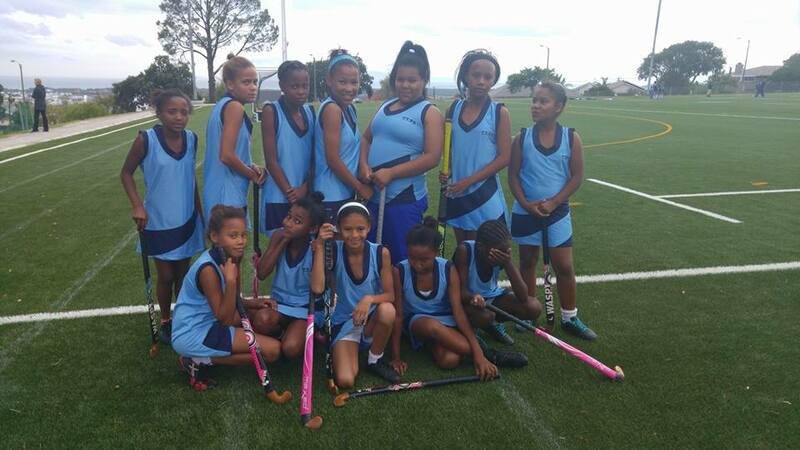 On 21 April 2016, our team again played against De Hoop school in Somerset West who were the winners with a score of 2 goals to nil. 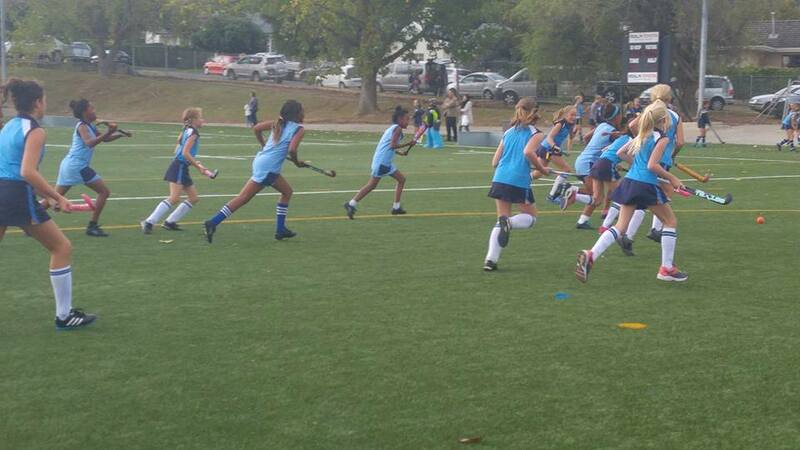 The Hockey club was started in 2012. The girls are witty, funny and have the tradition of rolling around on the grass in their white tee shirts and shorts after winning a game. 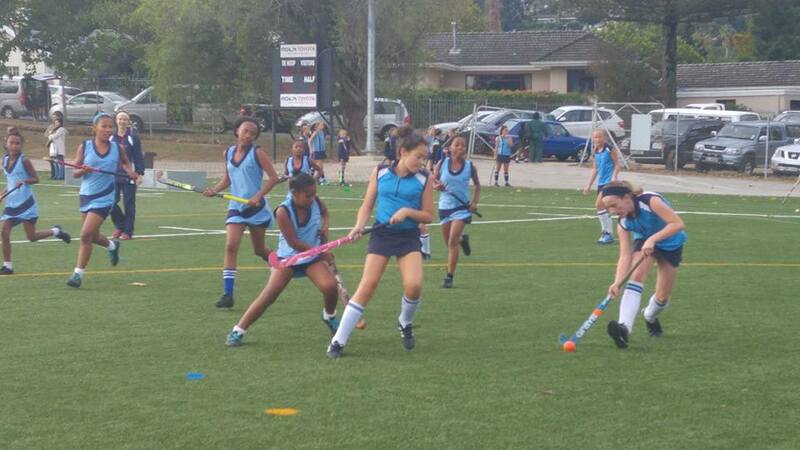 Dalene Jantjies is one of our most talented Hockey girls. 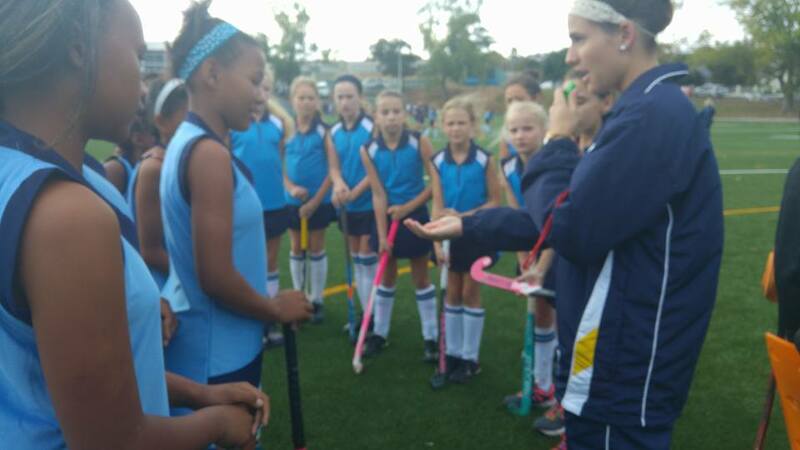 In 2016 she made her way into the Helderberg U 13 league. 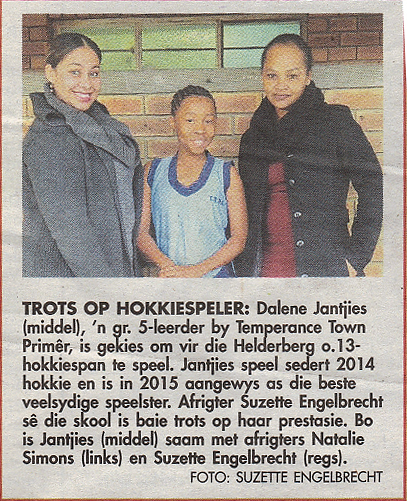 The article shows her with trainer Natalie Simons and Suzette Engelbrecht.